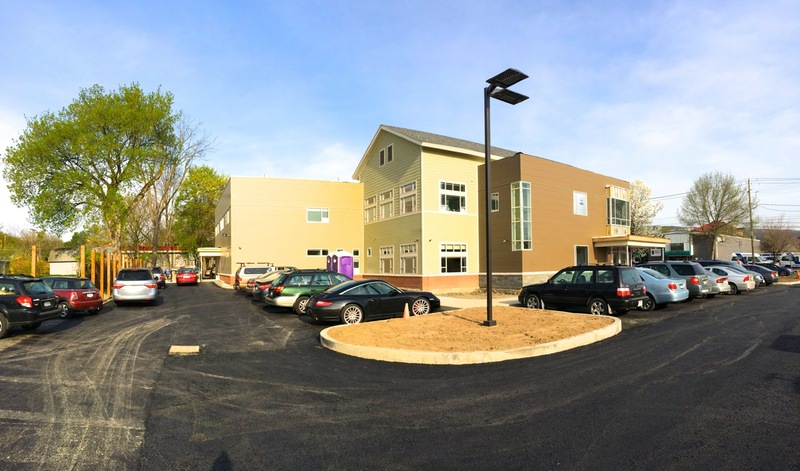 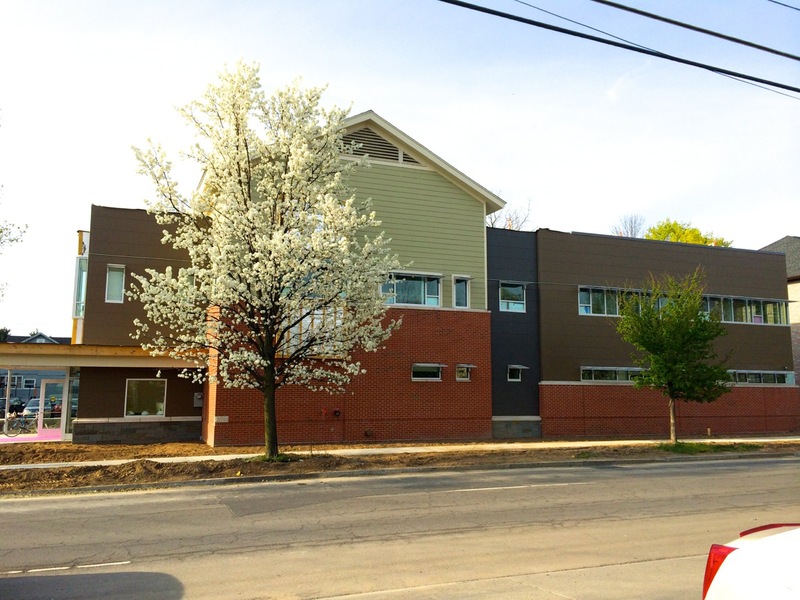 The Planned Parenthood of the Southern Finger Lakes‘ Ithaca project is nearing completion: the parking lot has been paved with asphalt by Heath Asphalt Paving, the remaining sections of sidewalk and curbing have been poured, construction fence taken down, remaining openings filled with windows, window shades installed, and various other exterior and interior finish work completed by LeChase Construction. 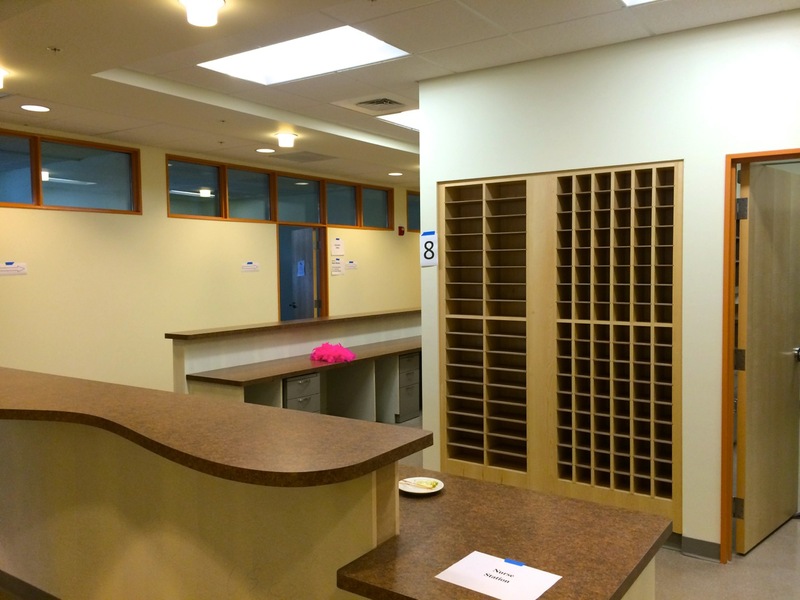 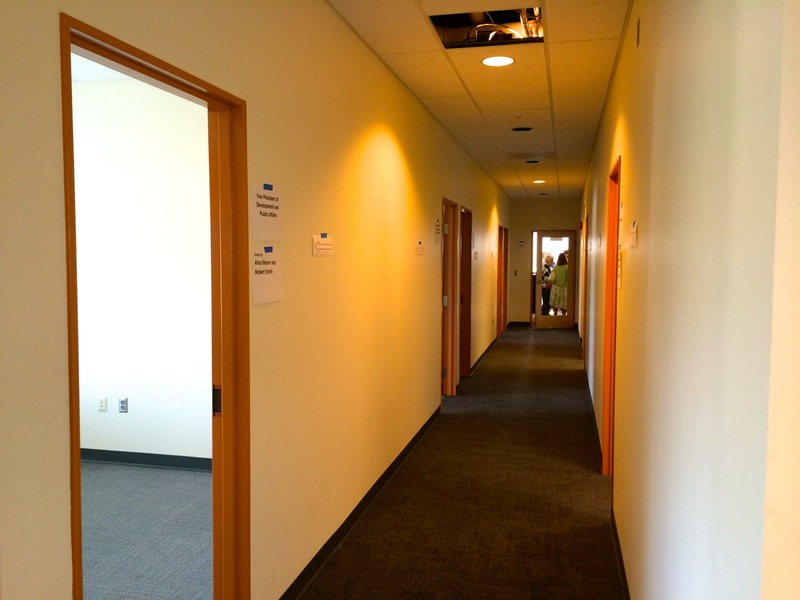 The organization hosted an open-house tour of their new facility this past Thursday, May 8th, and here are some photos taken from the exterior and interior. 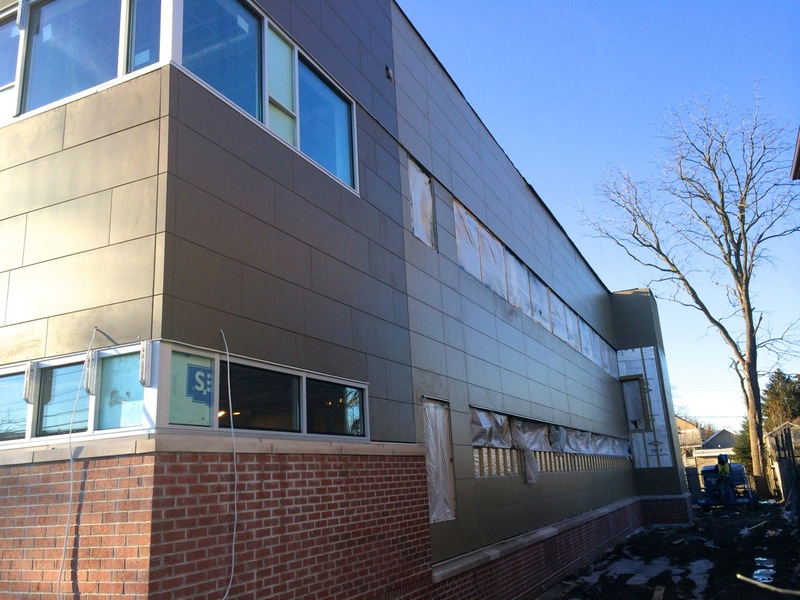 The design was done by Chiang O’Brien Architects. 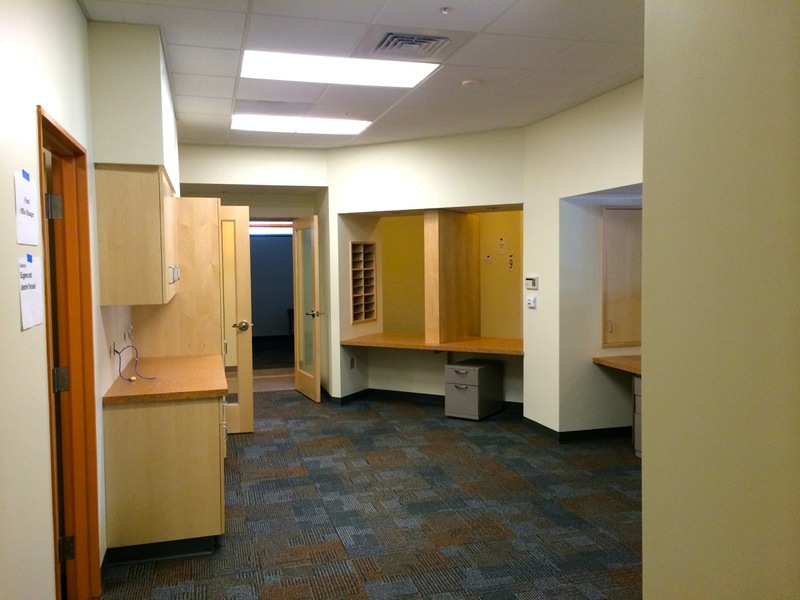 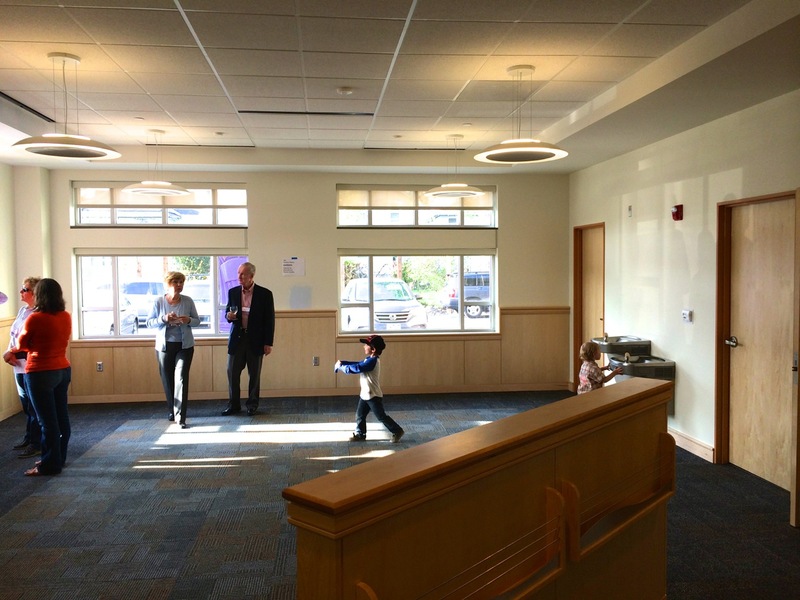 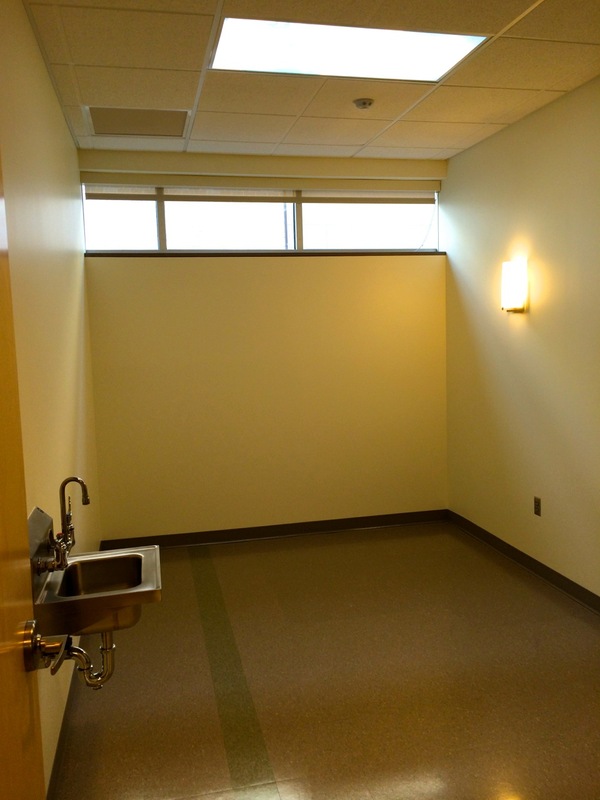 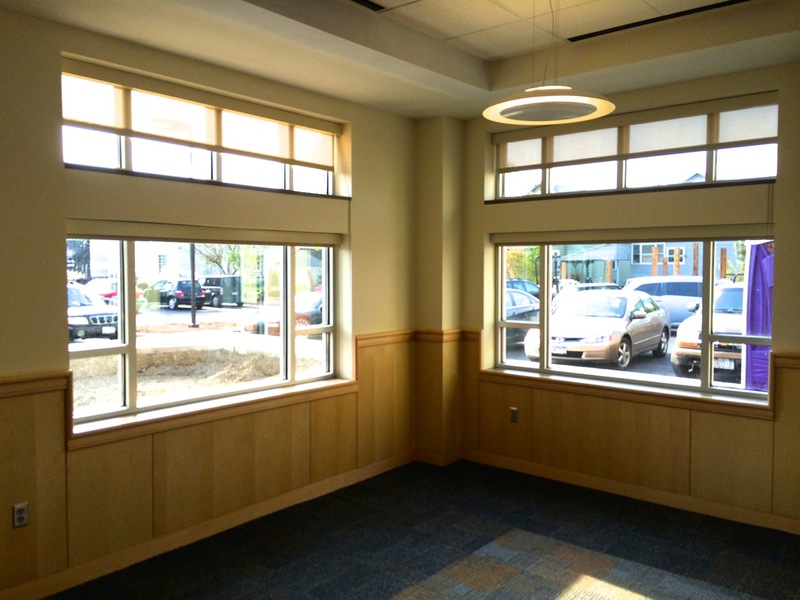 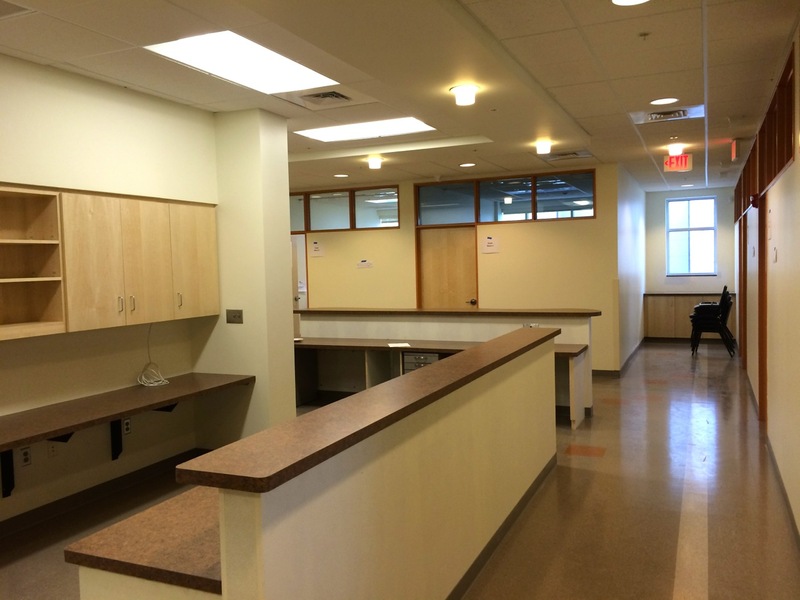 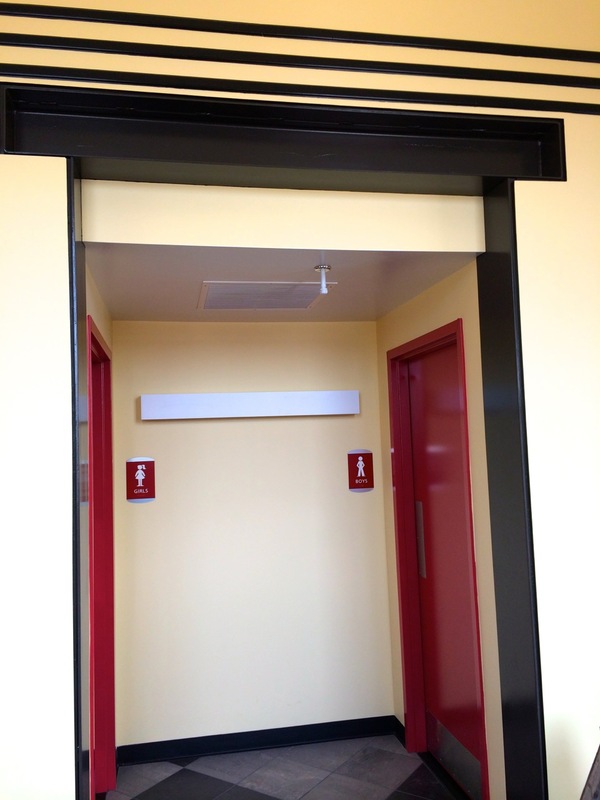 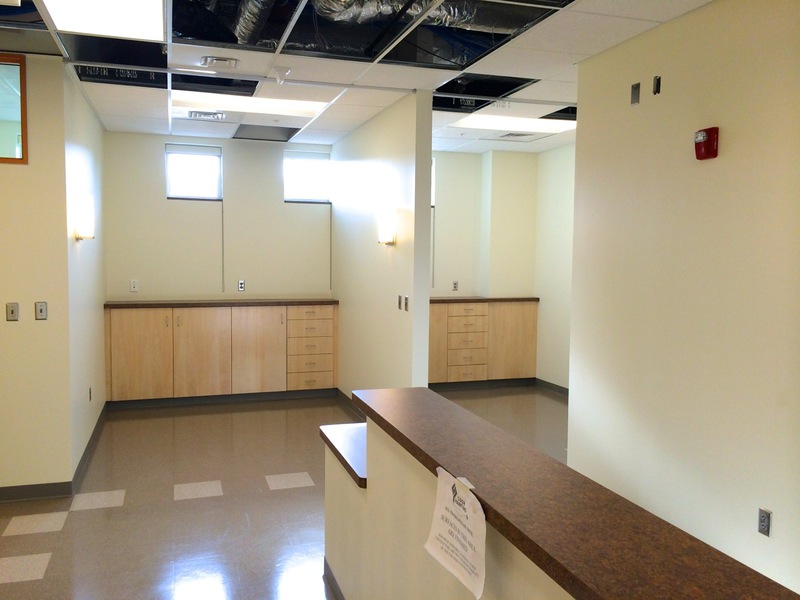 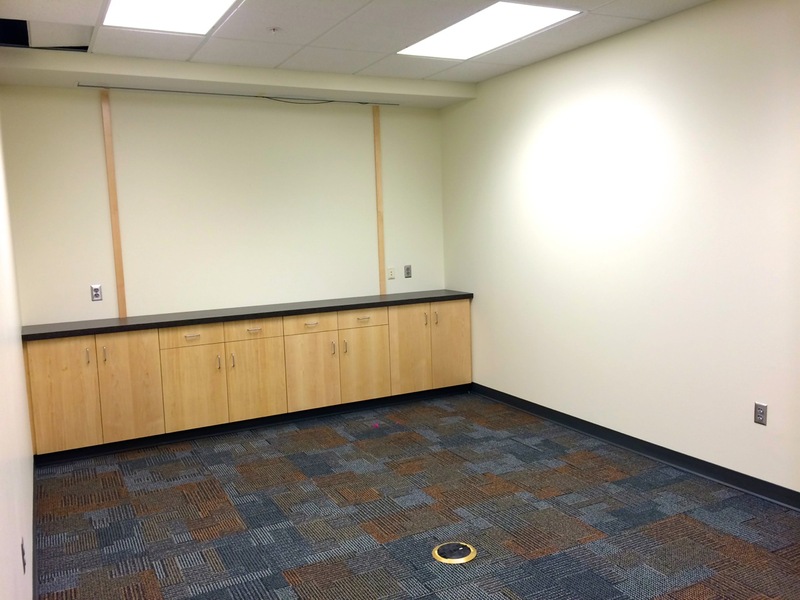 The interior finishes have nice features like metal-framed clerestory windows above solid-core doors for each exam room, a mix of carpet tiles and linoleum, solid cabinetry and countertops, and a variety of lighting fixtures. 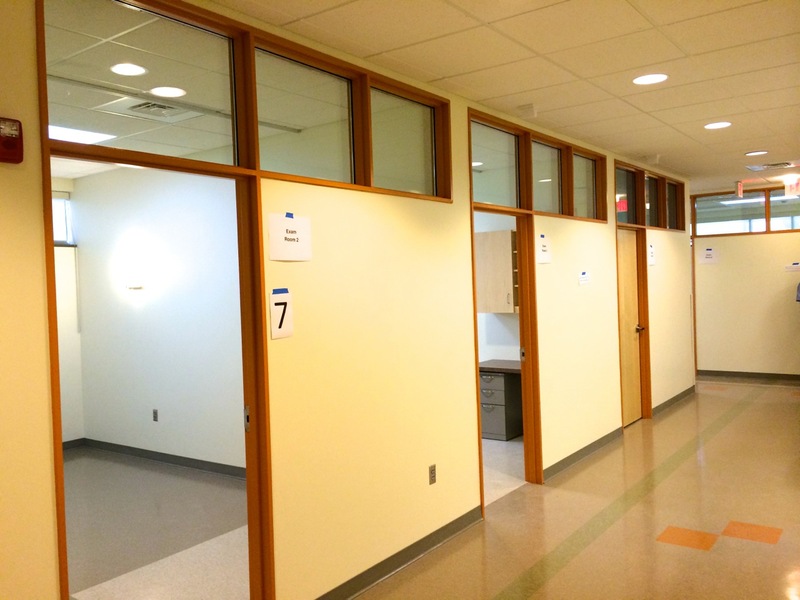 The layout on each floor is logical: a rectangular-routed hallway wraps nurse and administrative stations on the first floor, with exam rooms, offices, and the waiting room along the exterior walls. 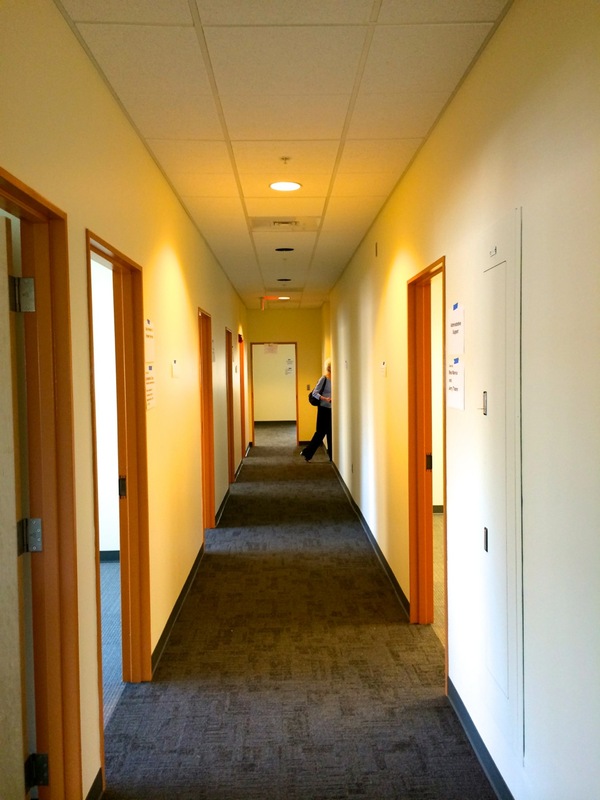 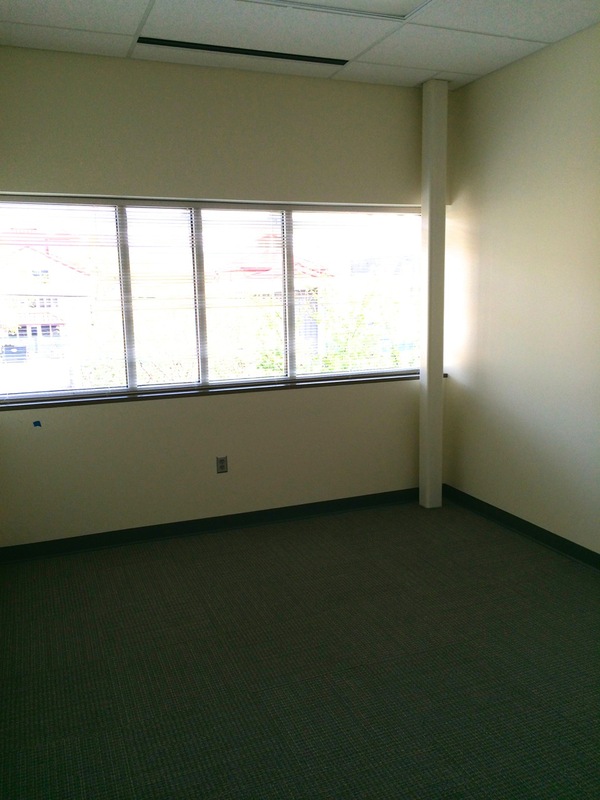 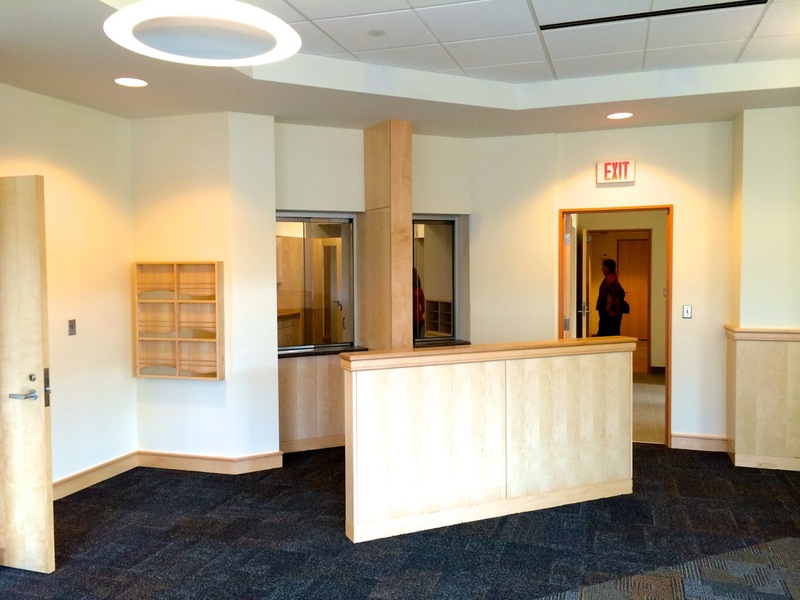 The second floor contains mostly office space, with an additional open waiting area, and a conference room. 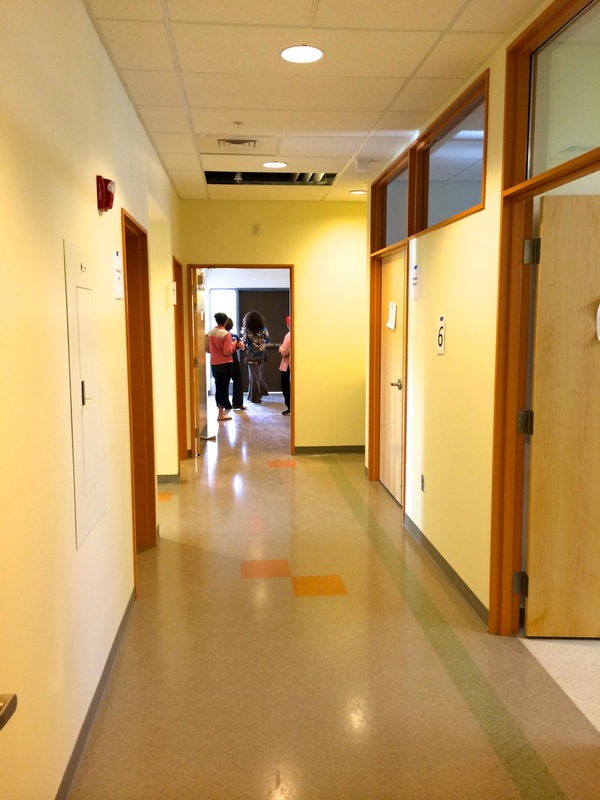 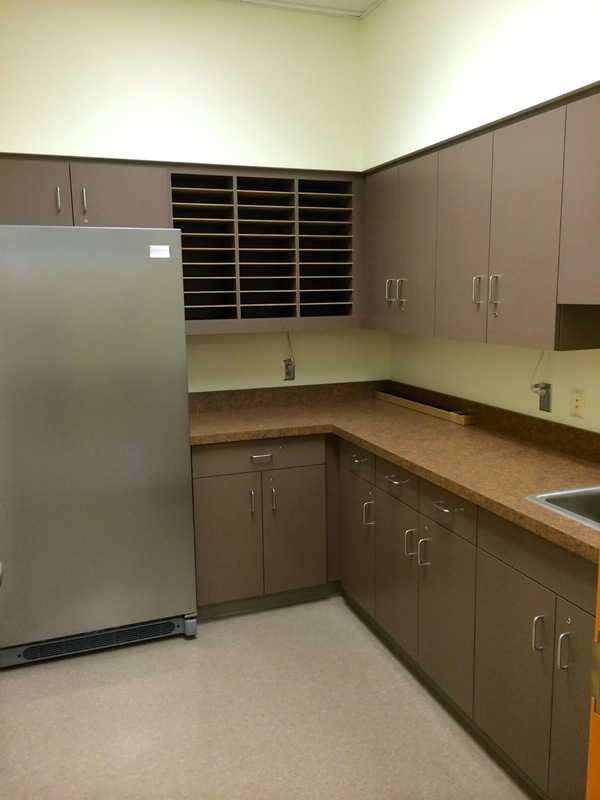 All in all, it’s a professional-looking project (and much improved space) for a great local organization providing valuable services for the area. 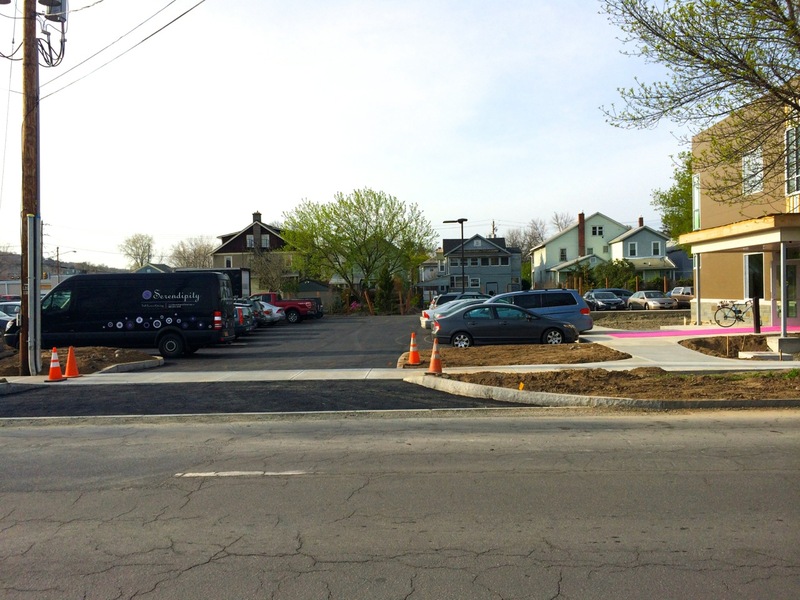 Hard to believe, but five days short of a year ago, the site was a flat plot of dirt and stone when I first took some photos here May 16th, 2013. 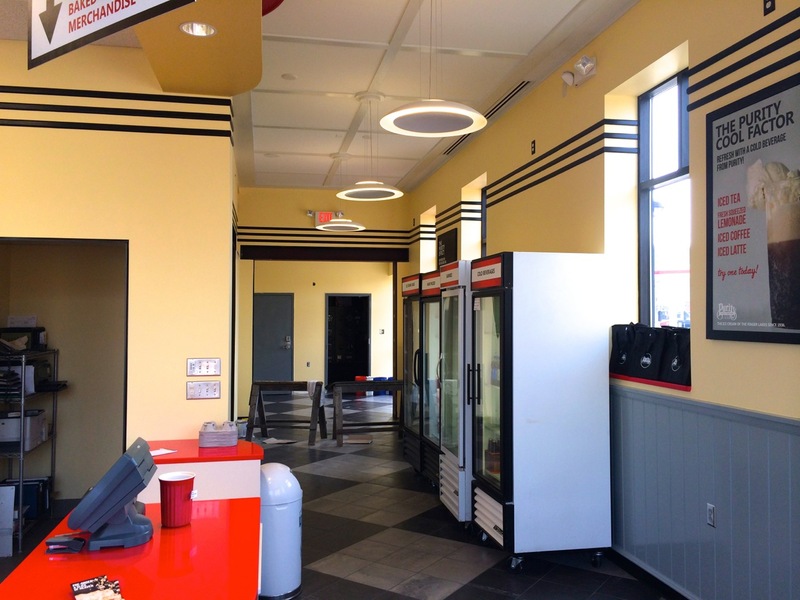 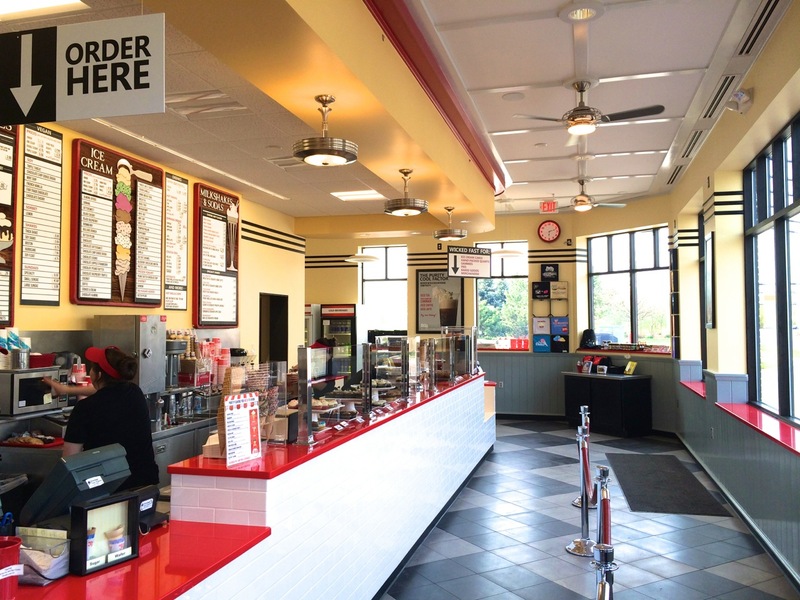 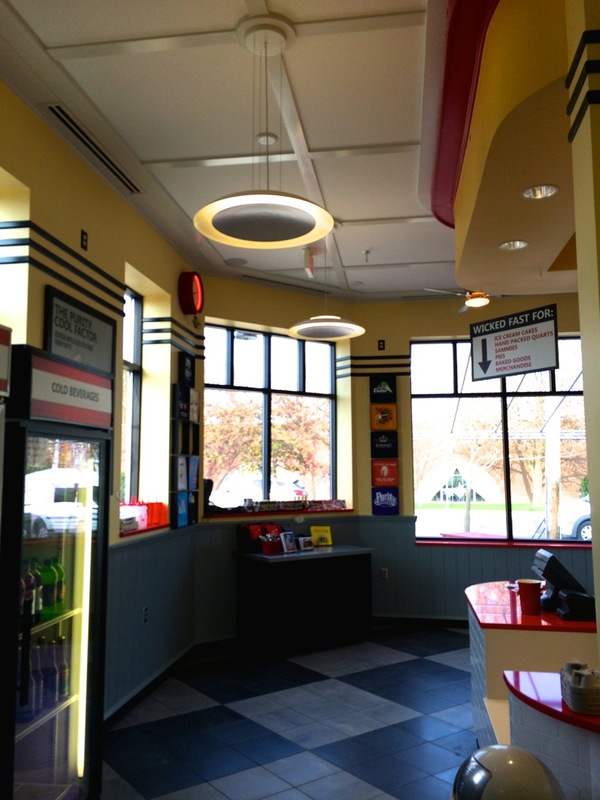 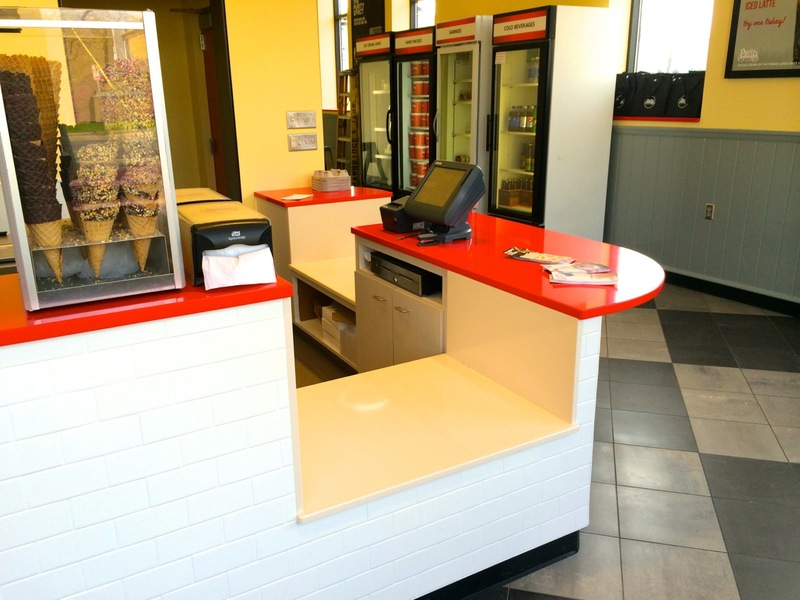 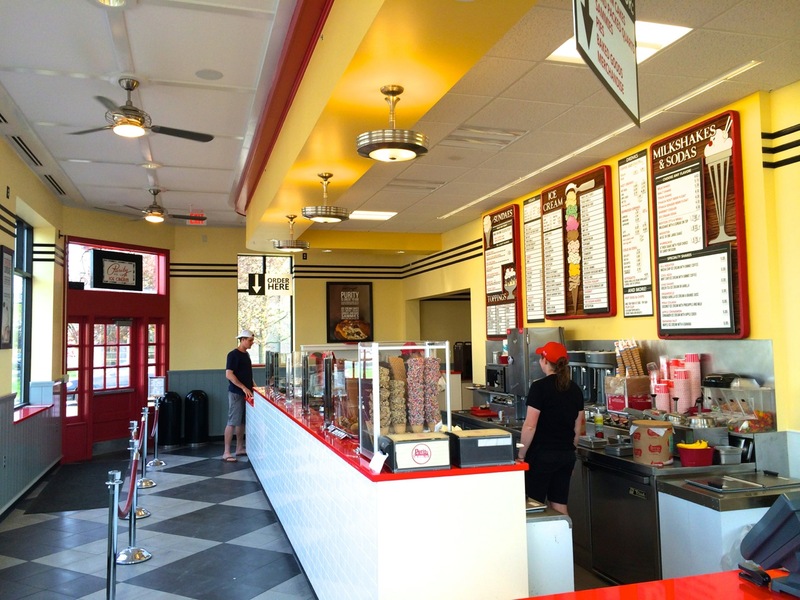 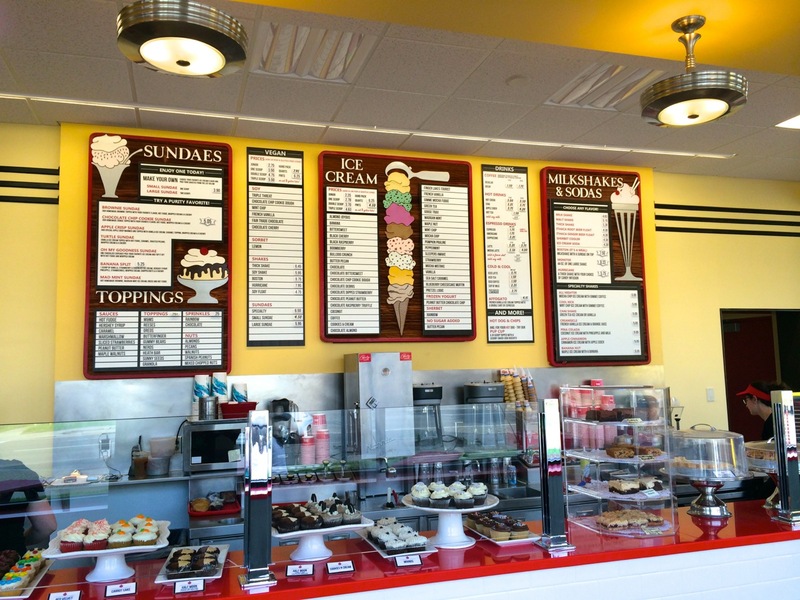 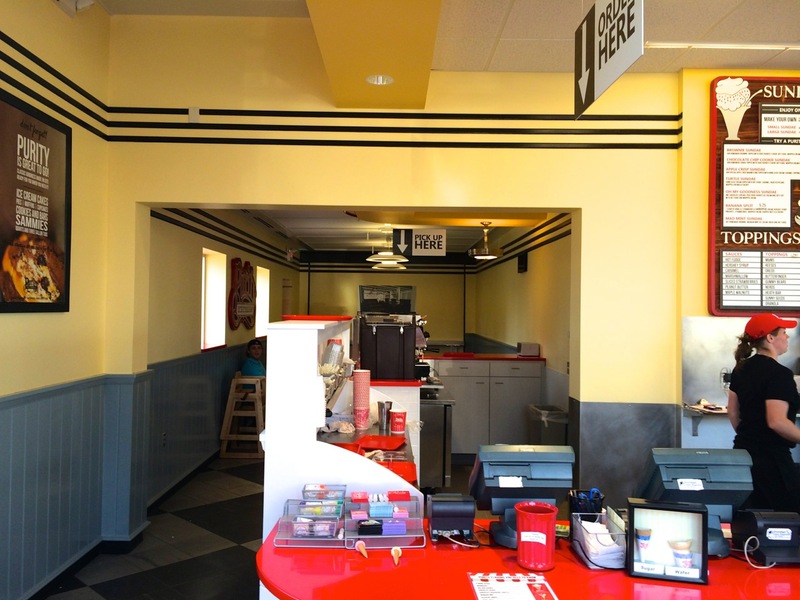 Purity Ice Cream has re-opened and their renovated counter, serving area, seating, and bathrooms are ready to go. 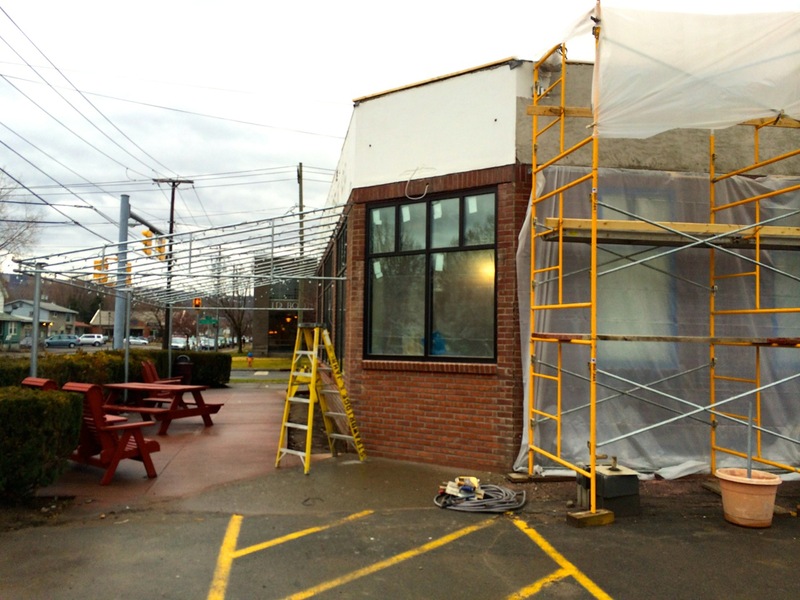 The side entry should follow-up shortly, and a new canvas awning will be going over the new steel canopy above the outside seating. 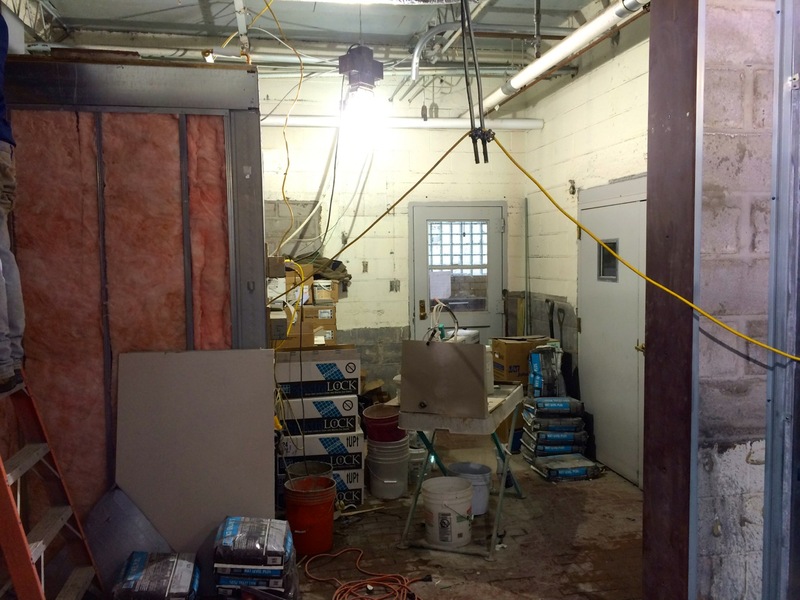 The renovations began back in January with some significant interior demolition of the entire serving, seating, and bathroom areas. 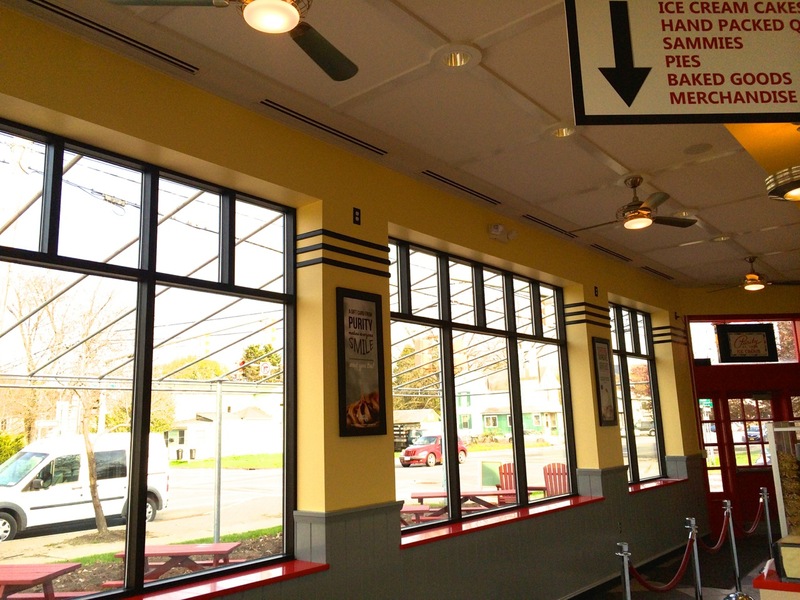 The electrical, plumbing, and HVAC have all been completely re-done, and the finish work is all new, minus the lovely old menus. 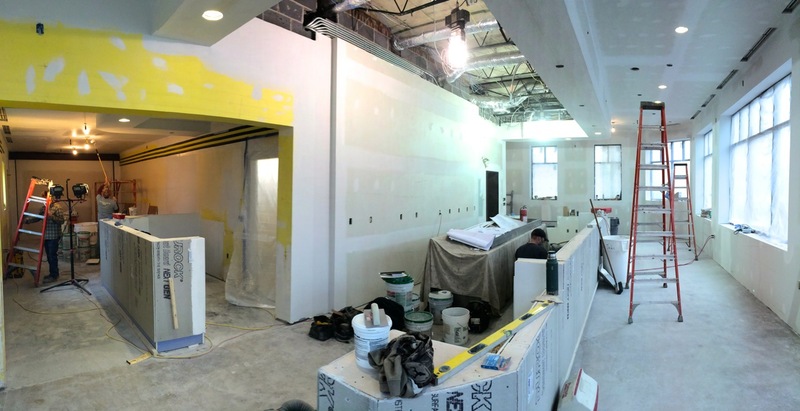 The re-opening comprises the first phase of the project, with the interior demolition and re-furnishing of the old prep and production rooms for a large area of additional interior seating to follow. 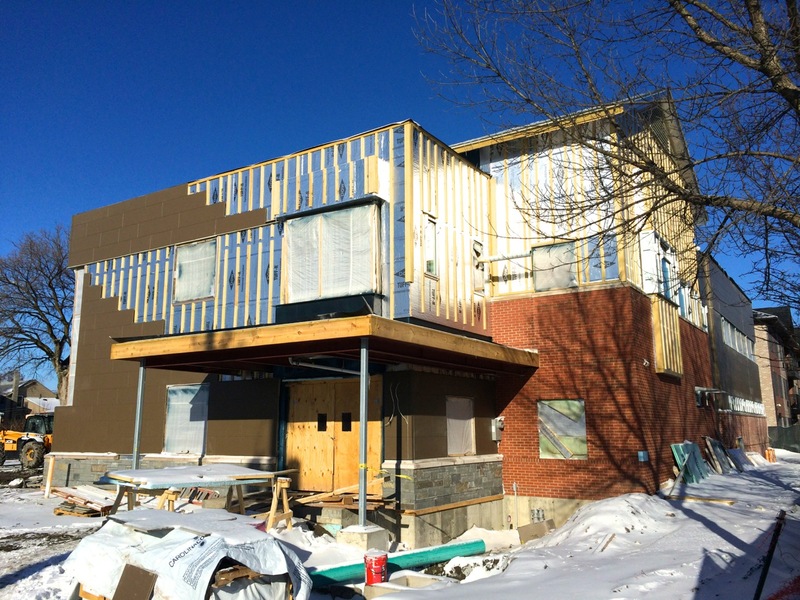 The back (west) portion of the building will be built-out for commercial tenancy, as the existing building contains ample room for a nice office unit. 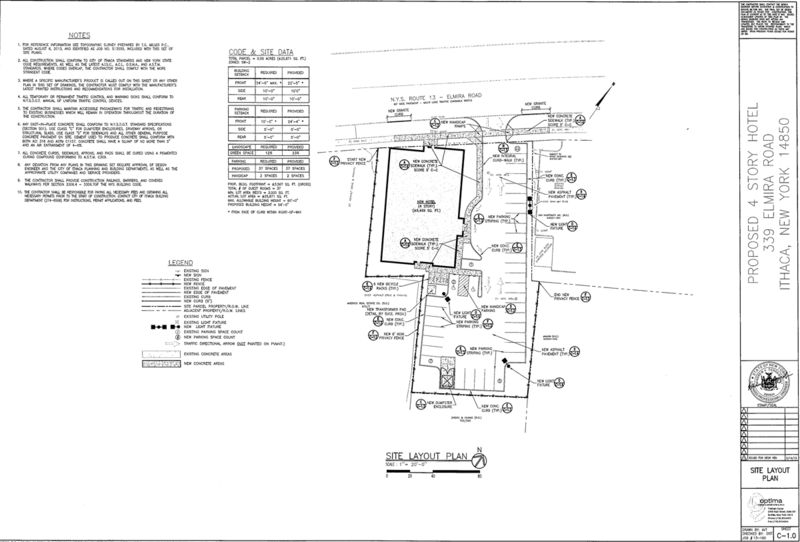 At this time the roof plans from the initial January plan are undetermined, so there may or may not be areas built-out above. 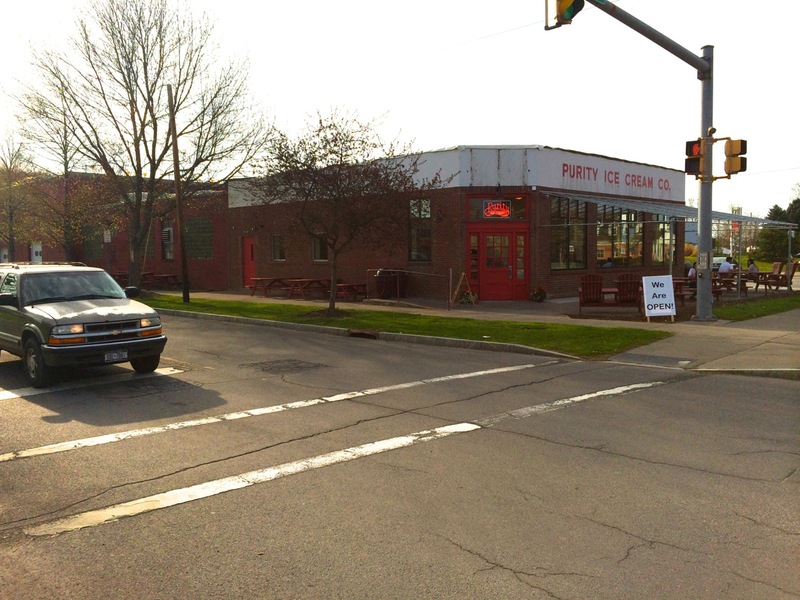 As the temperatures finally rise to sweat-weather in Ithaca, swing by Purity at the intersection of Meadow St and Cascadilla St and get yourself some ice cream! 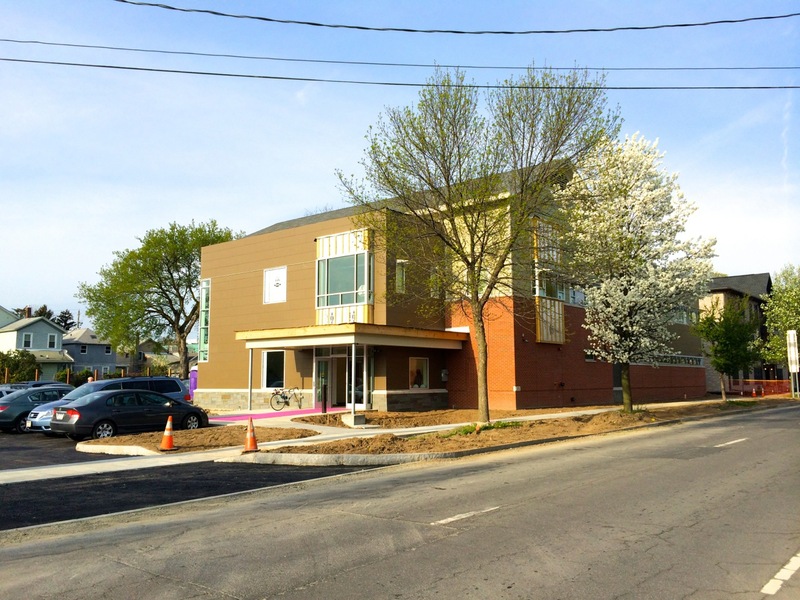 The project was designed by John Snyder Architects, and work completed by Strawbridge and Jahn Builders, along with specialty trades from the area. 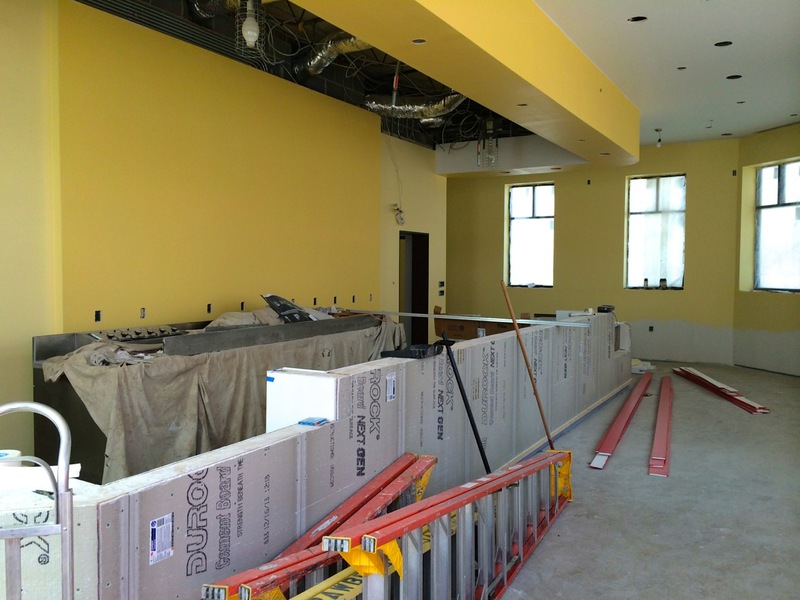 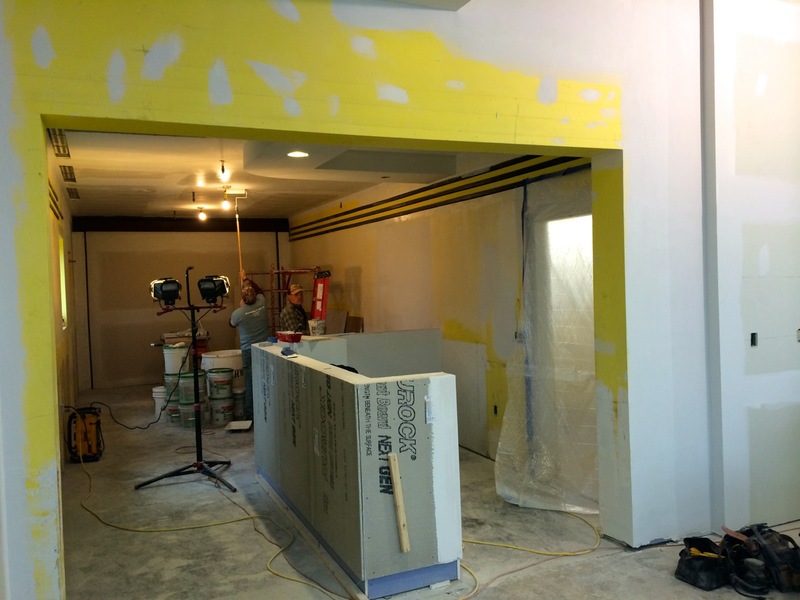 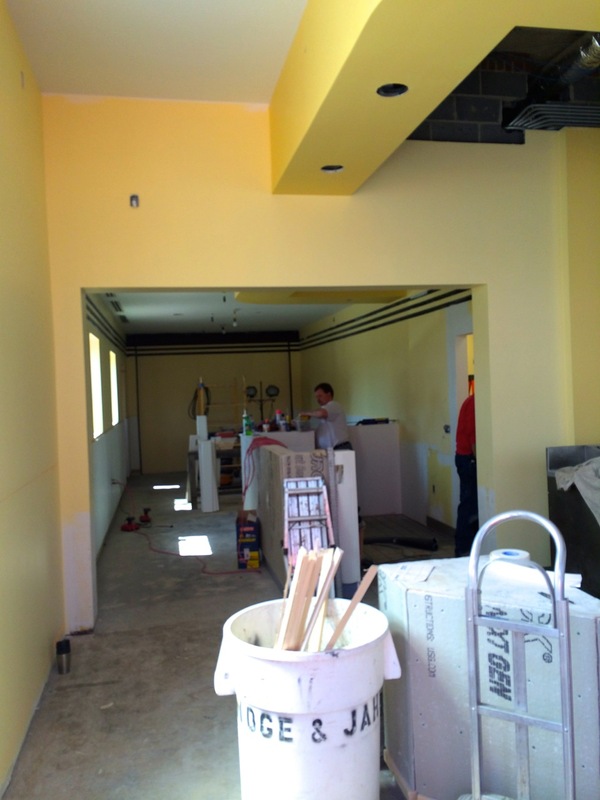 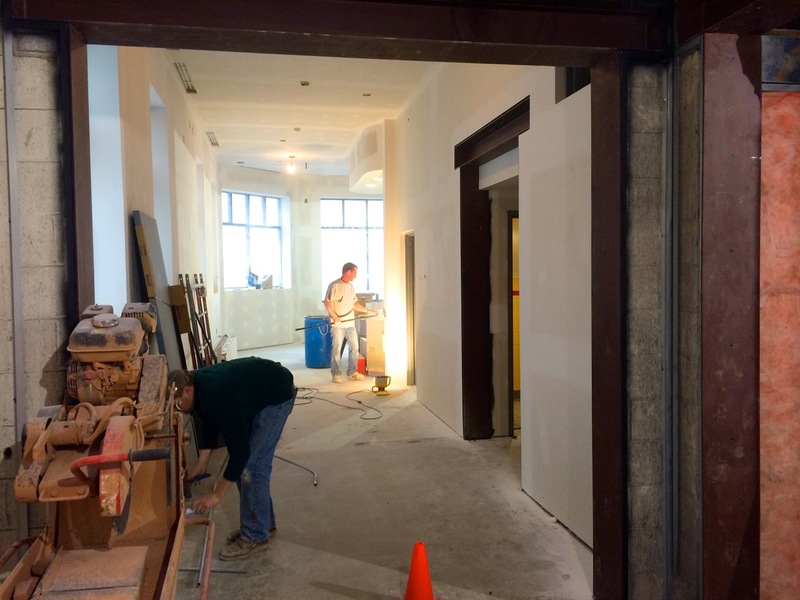 The Purity Ice Cream project is reaching drywall-finish stage as demolition finished-up back in February, then the bathrooms, former entry, new entryway, seating, and serving areas were re-framed by Strawbridge and Jahn Builders and outfitted with mechanicals. 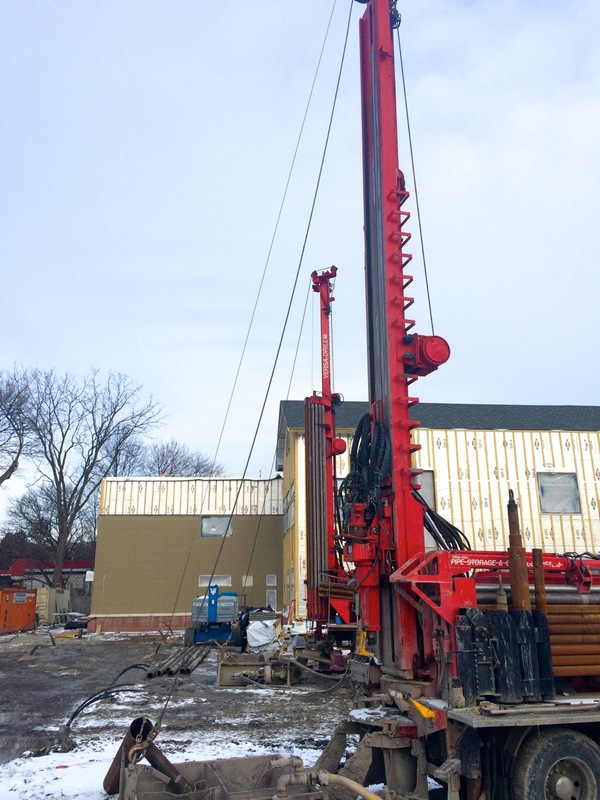 A new trench was dug and filled across the parking lot for an improved underground power service, while all the electric was re-wired by Richardson Brothers Electric. 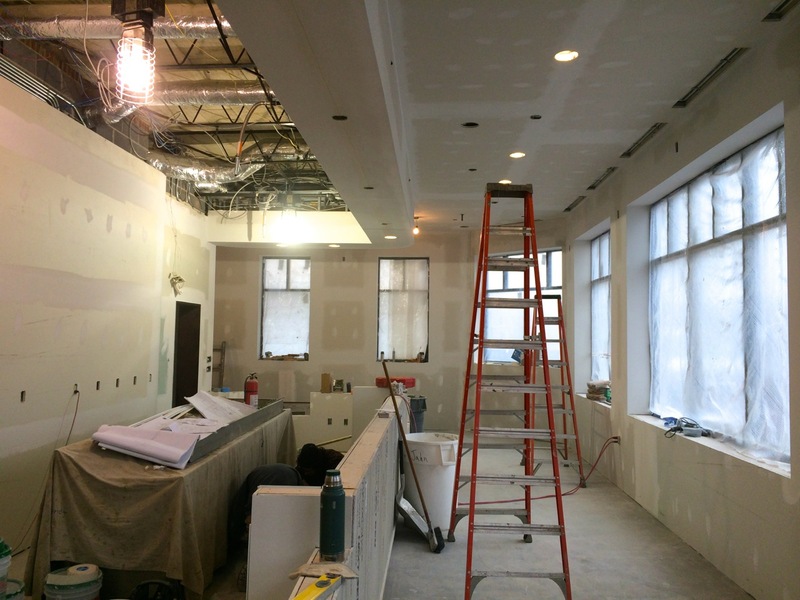 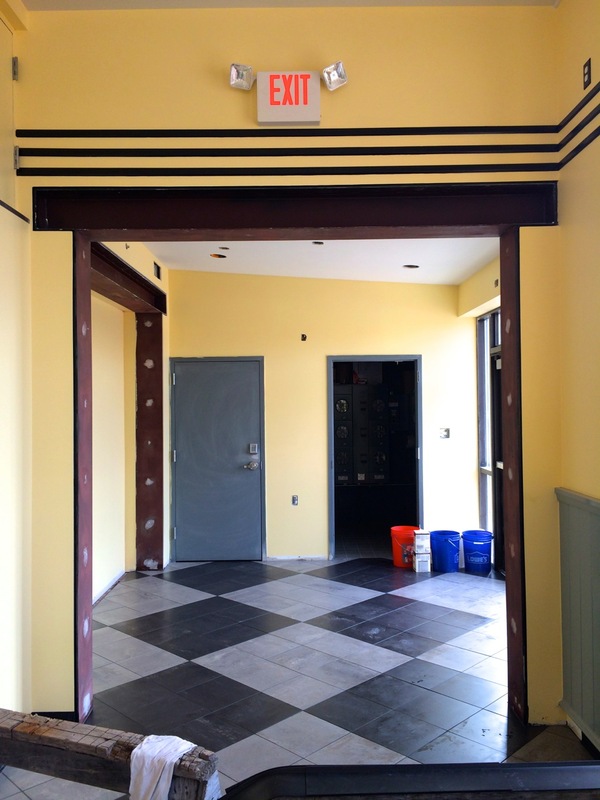 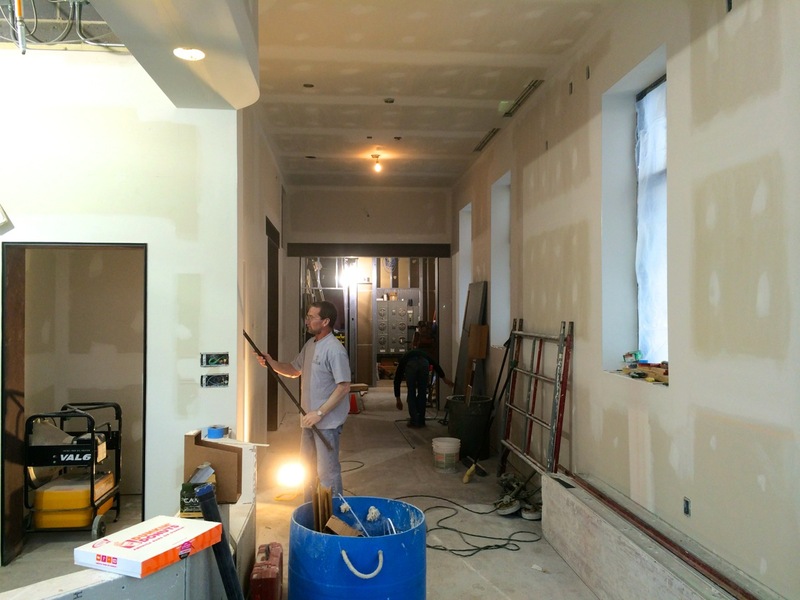 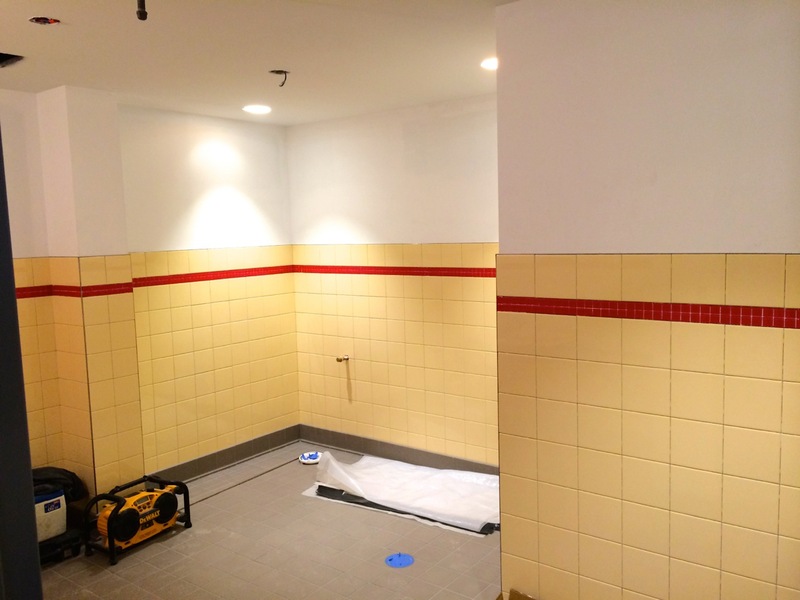 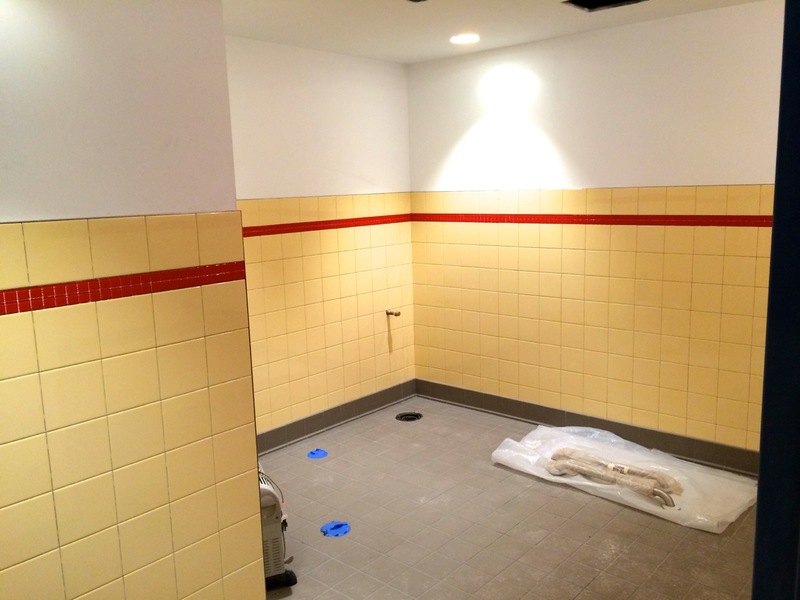 New lighting fixtures, an entirely new HVAC system, and plumbing have been roughed-in. 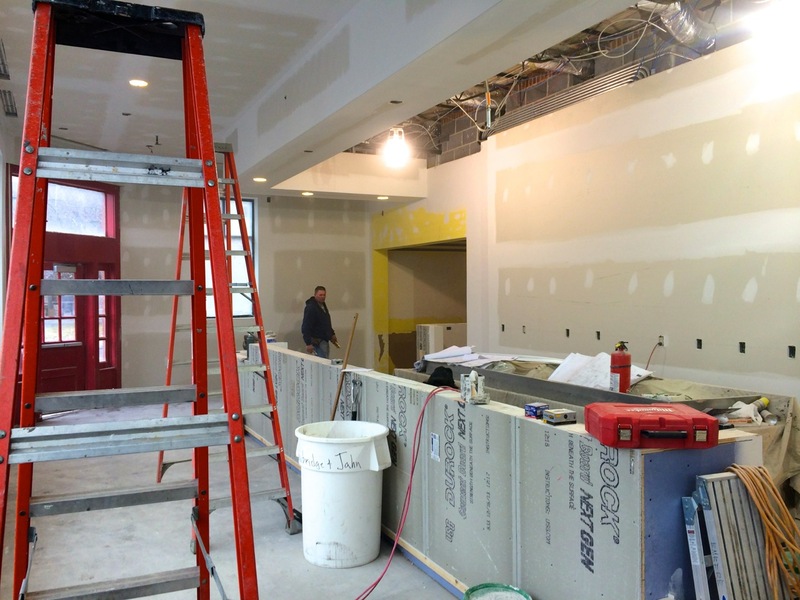 Drywall and cement boards have been hung, taped, mudded, and the seams were being sanded down this past week. 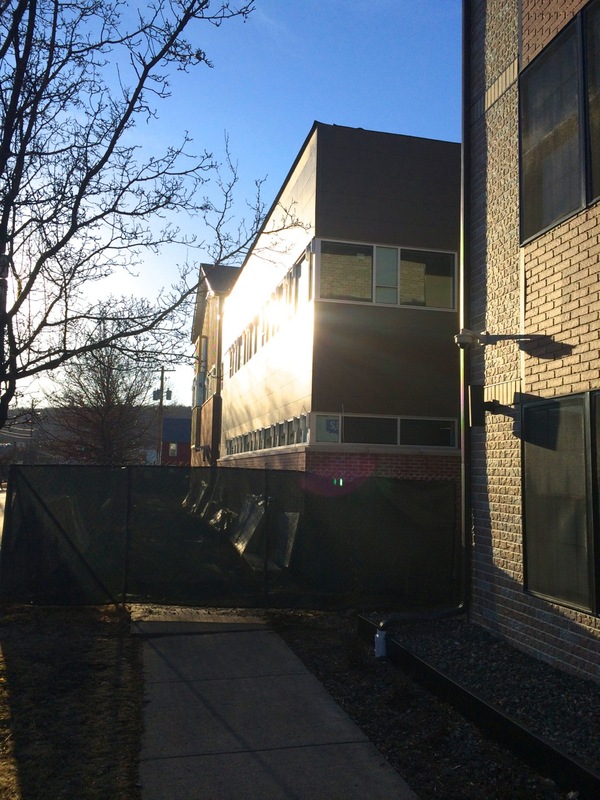 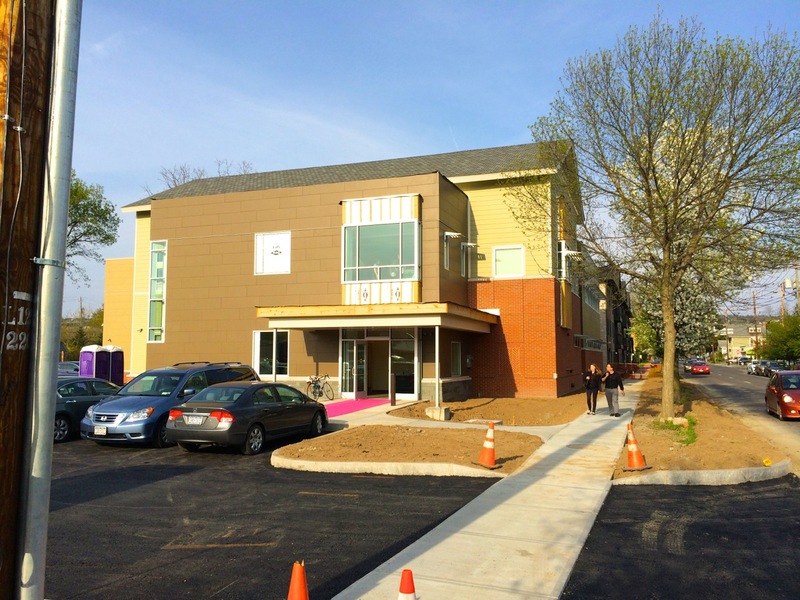 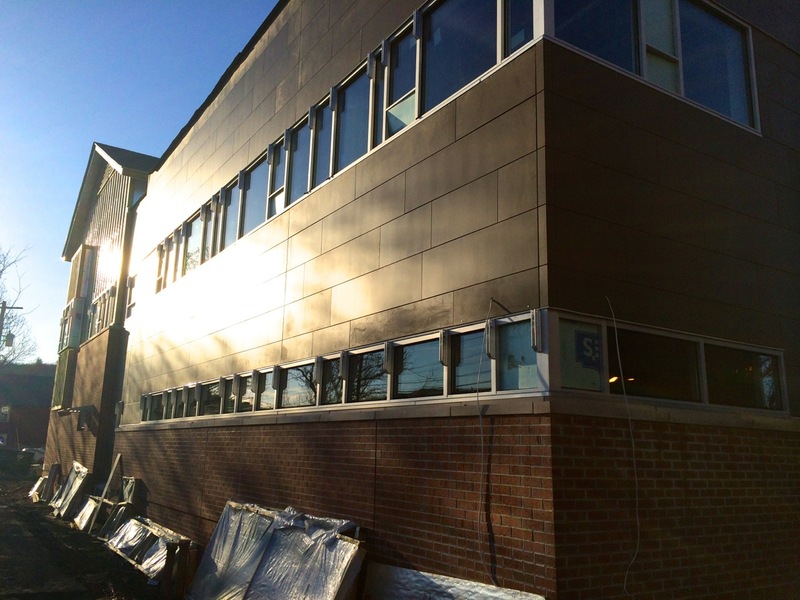 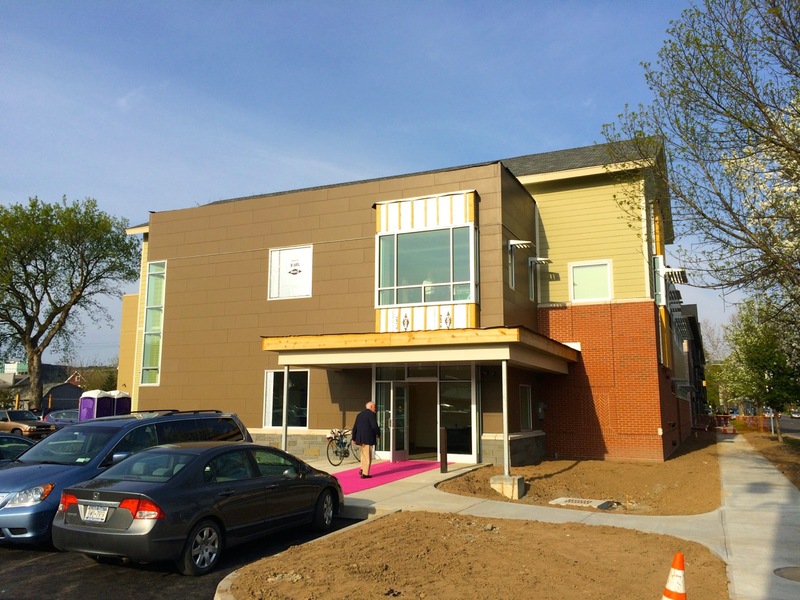 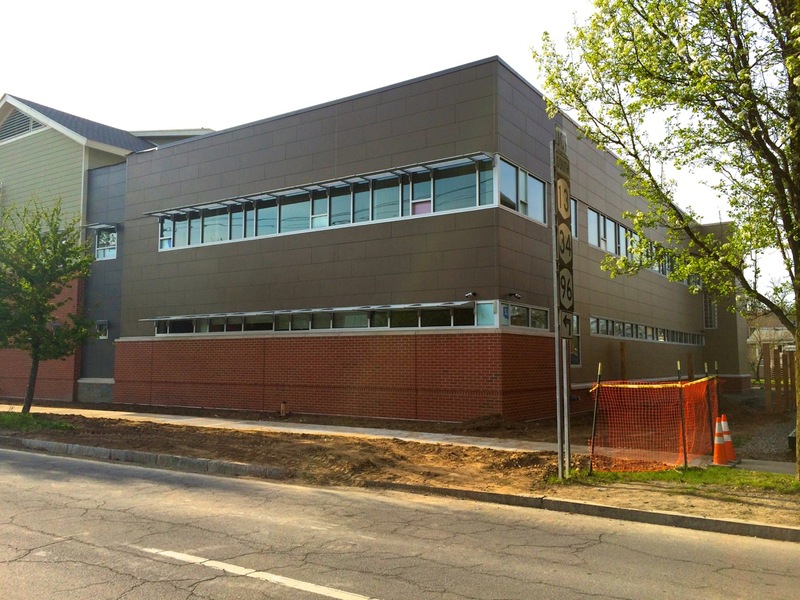 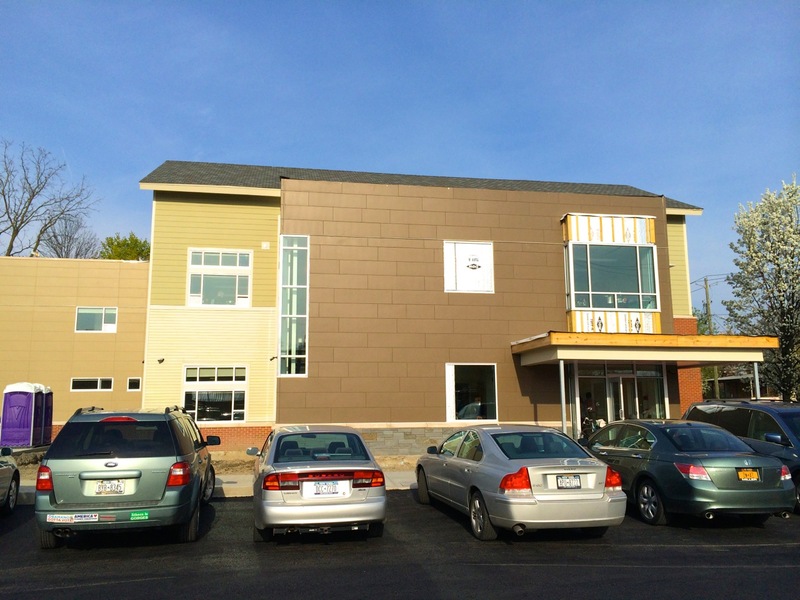 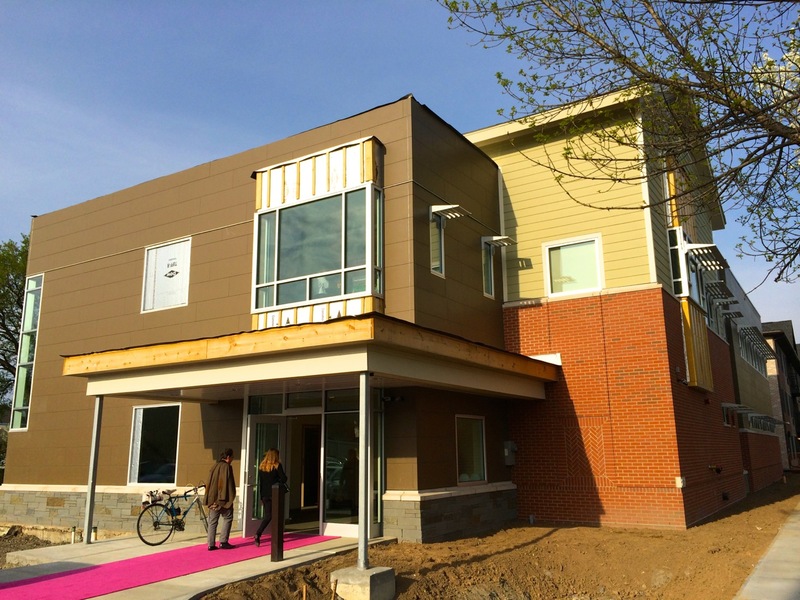 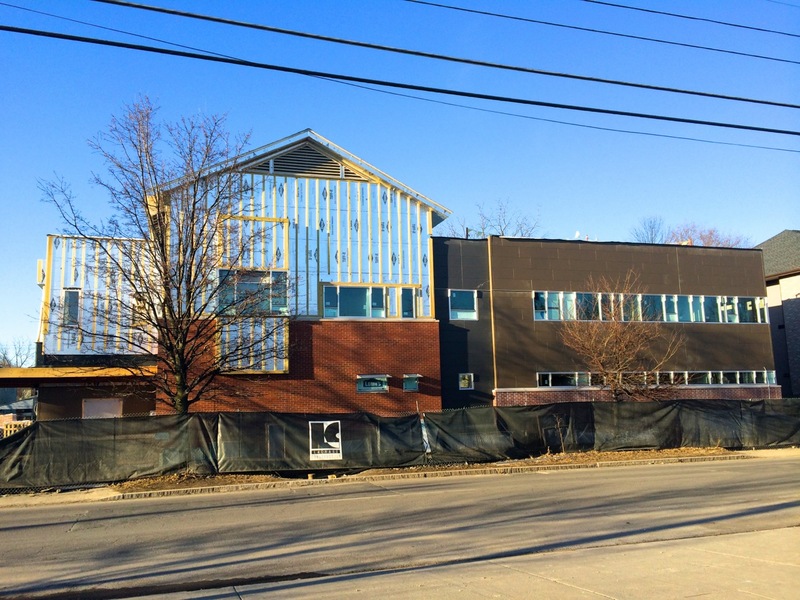 The 16,000 square foot Planned Parenthood project on Seneca Street in Ithaca’s West End has been transforming on the exterior at a rapid pace. 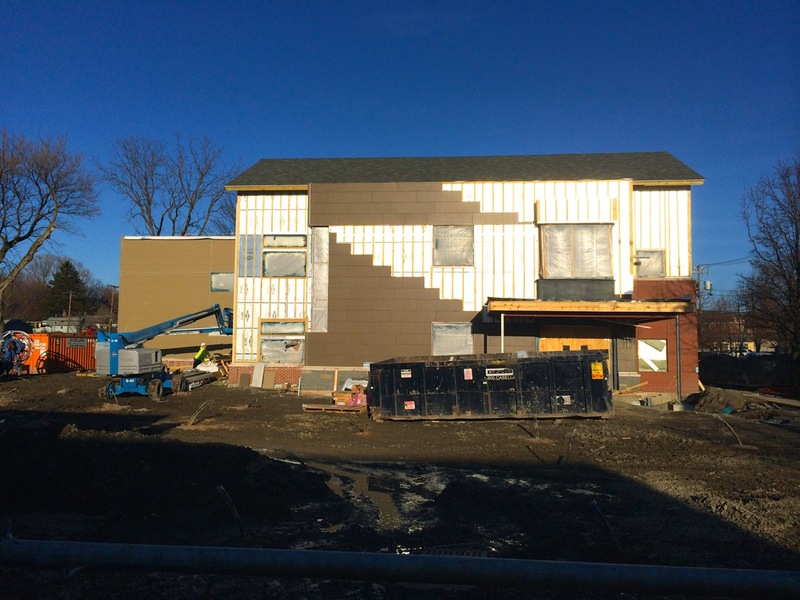 The fiber cement panel siding has been finished-up on much of the Seneca side, and all of the eastern side within the past two weeks, and windows have been installed along the Seneca side. 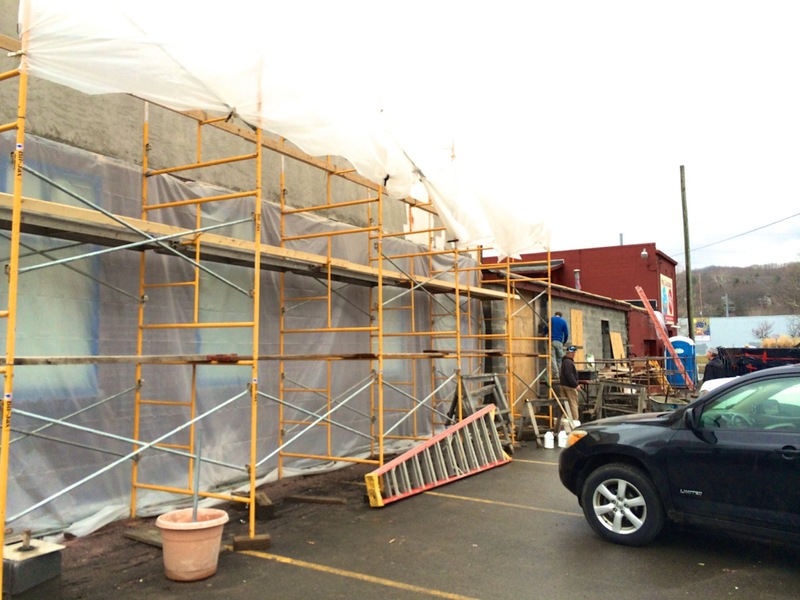 The brick portions were completed back in early February, and hanging the remaining fiber cement panels will probably go quickly now that the weather is becoming more favorable. 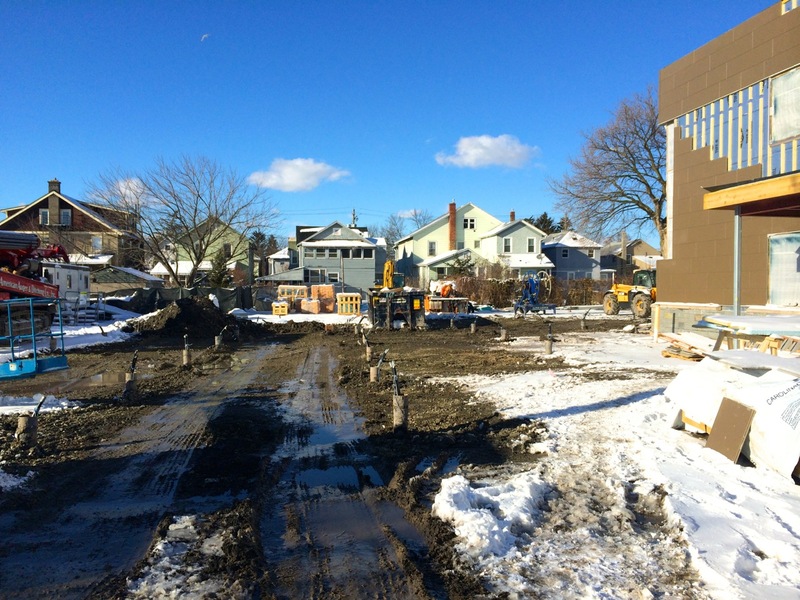 For those interested, the last post contained some information about ground source heat pump systems; one will be installed on this project, as the drilling concluded a couple weeks ago- see the series of tubes sticking out of the ground on the western side (those are the refrigerant loops). 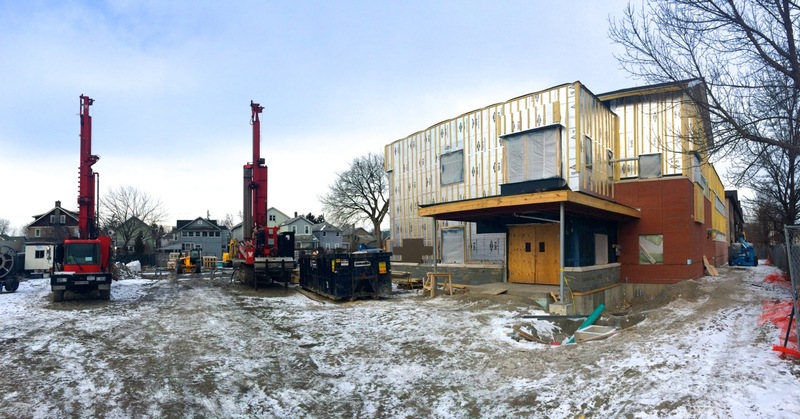 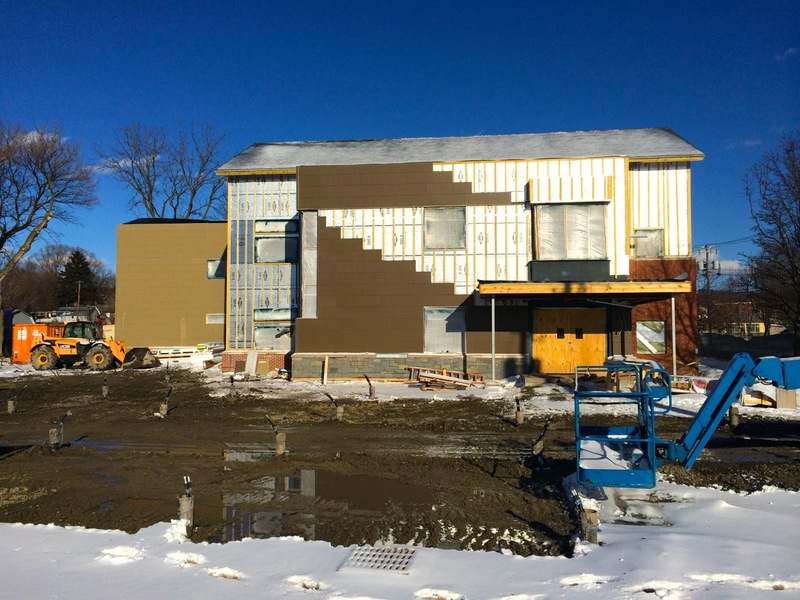 This project is being constructed by LeChase Construction (which now has an office in Ithaca), and was designed by Chiang O’Brien Architects. 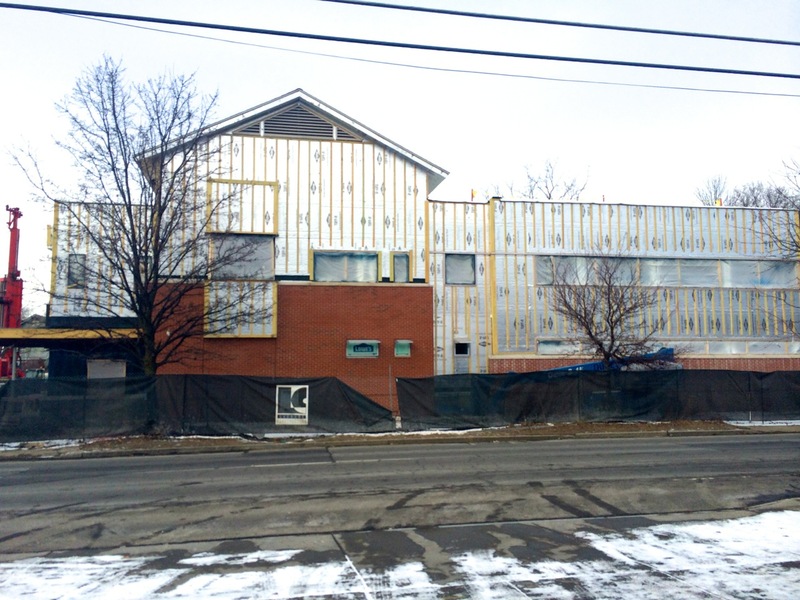 Wegmans: Possible Wine & Liquor Retail Store? 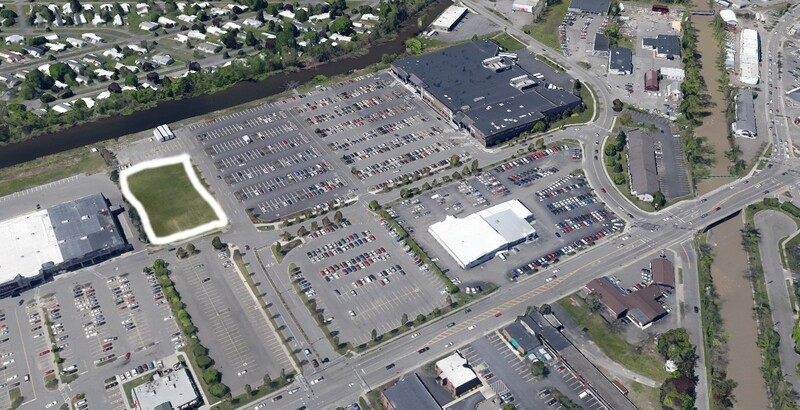 Last February’s City of Ithaca Planning & Development Board meeting contained a sketch plan item that seems to confirm Wegmans’ intention to develop the grassy open portion of land to the south end of the parking lot. 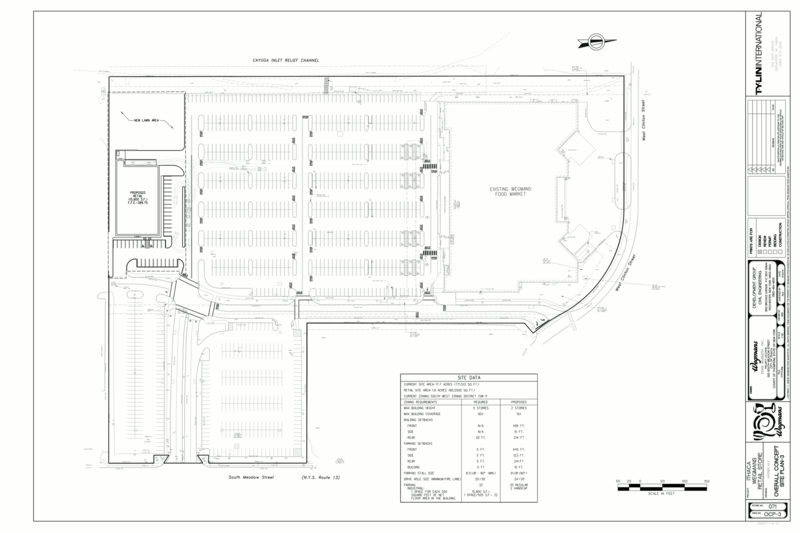 In the preliminary sketch plan, a new 15,900 square foot building is proposed, with a retail face towards the east end, parking along the east and north, and a loading dock in the west end. 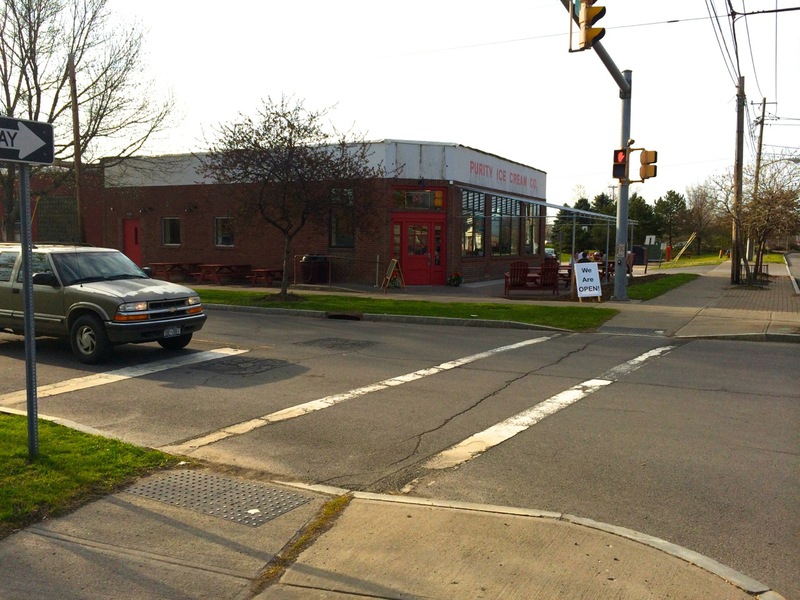 The intersection is also showing pedestrian crosswalks, along with a plan to remove pavement along the southwest corner of the lot, replacing with soil. 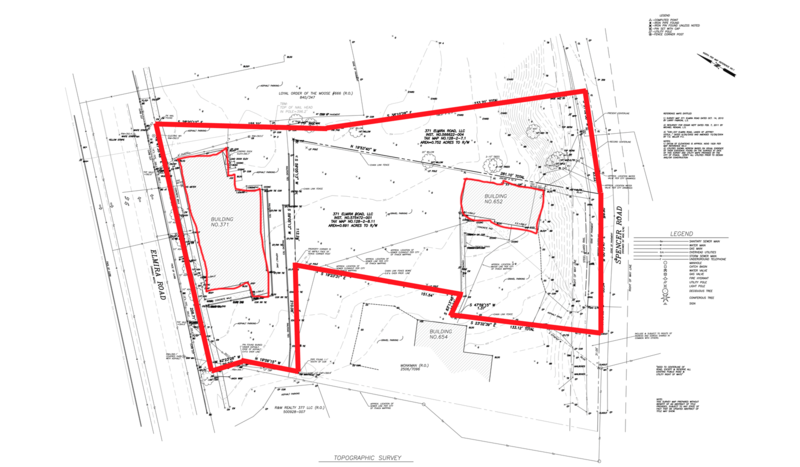 At first glance, it looks like it could be a retail store for lease, but since Wegmans owns the parcel, and the design is coming directly from Wegmans, it may be a plan for a wine & liquor location. 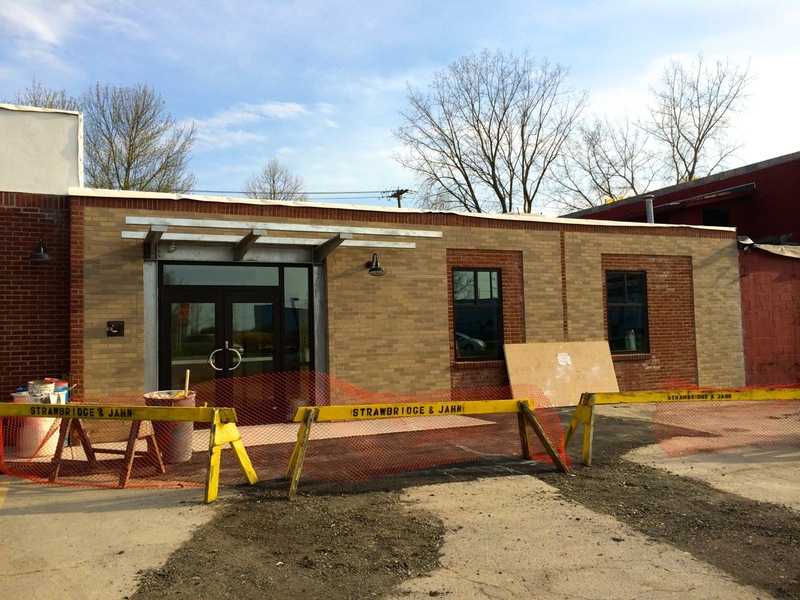 Wegmans is putting a liquor store in Johnson City for an opening this Spring, and they have branded “Wine, Liquor & Beer Stores” in a few other states, but their brand in New York is separate. 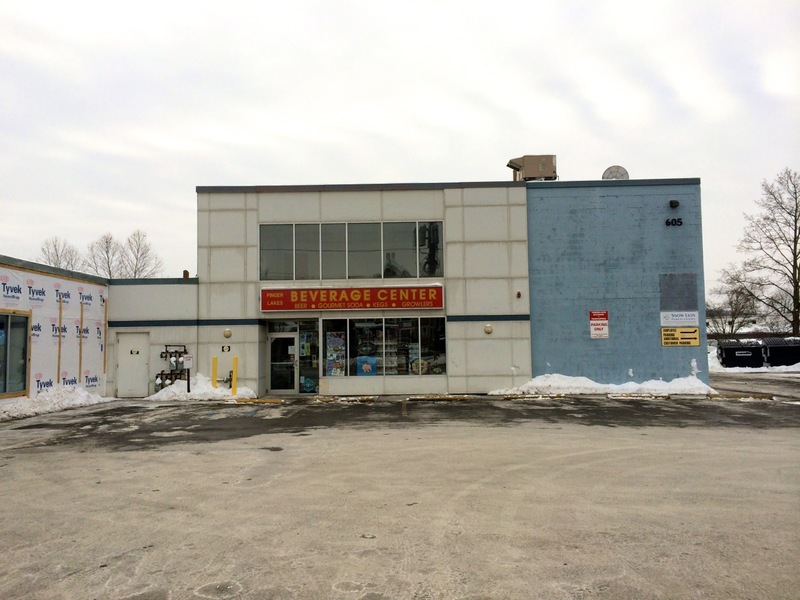 The Pittsford location is called “Century Liquor and Wines“, but it’s owned and operated by Wegmans, along with several other locations, including an acquisition in Syracuse five years ago. 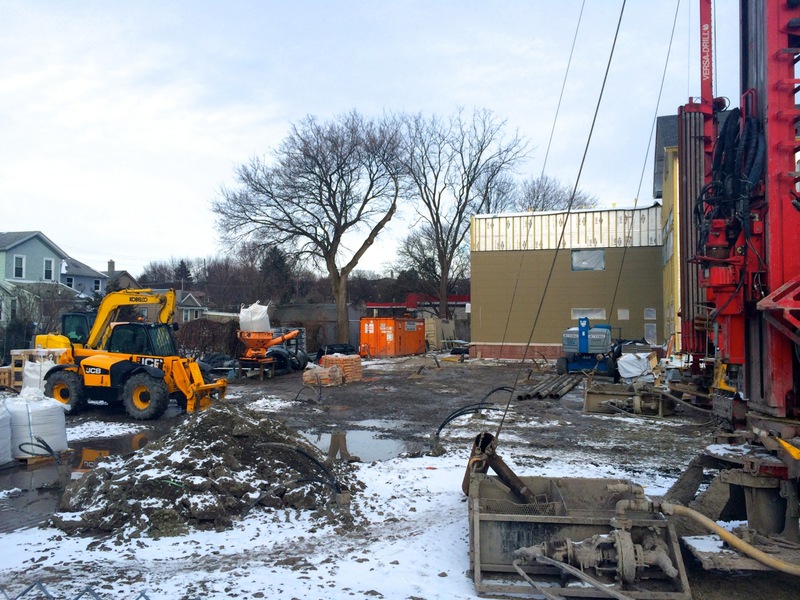 I wanted to follow-up with some existing site photos for the future Holiday Inn Express at 371 Elmira Road, so I stopped-by to take a few. 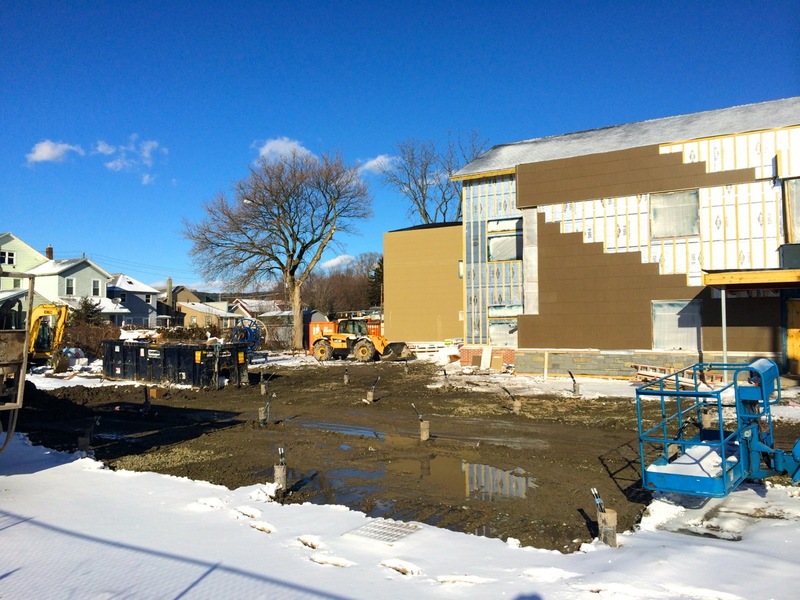 If all goes well, I’d expect to see site work beginning this Spring or Summer. 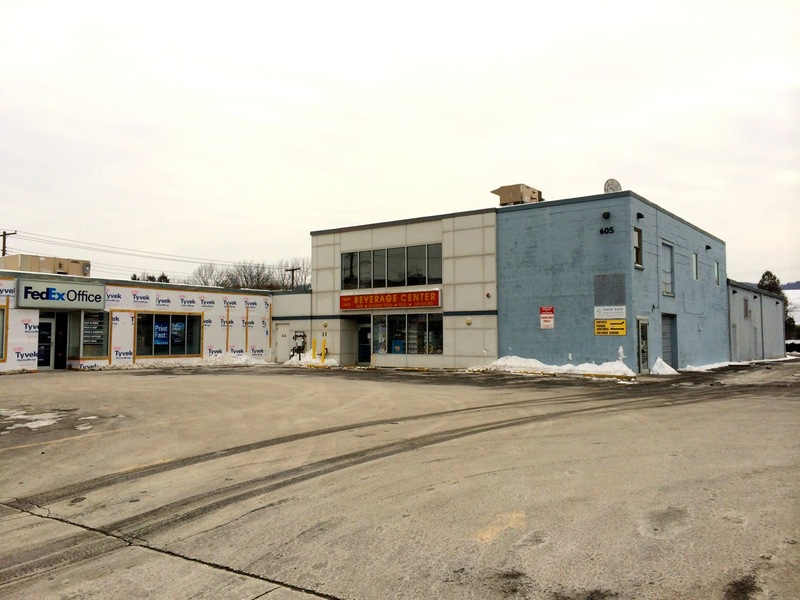 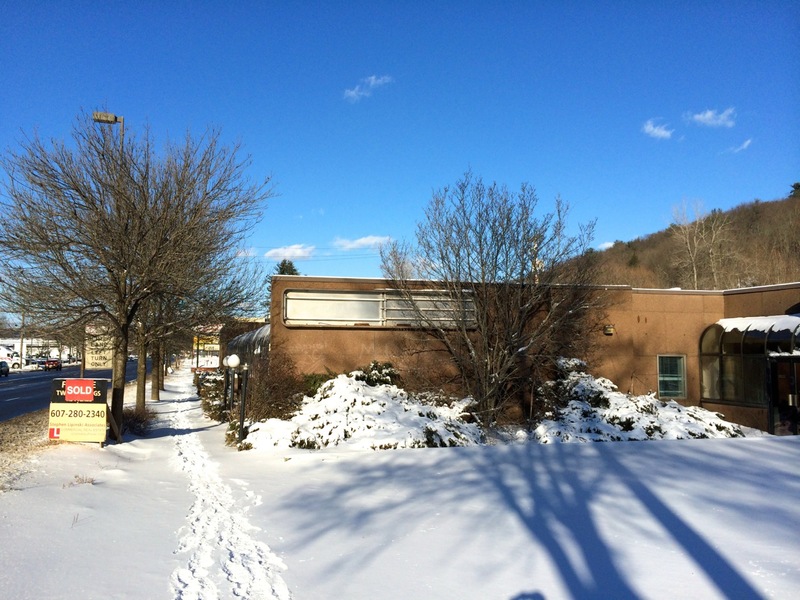 The existing 960 square foot former auto-body garage on Spencer Road and the 7,554 square foot one-story commercial office building along Route 13 will be demolished, and the two parcels will be consolidated into one parcel. 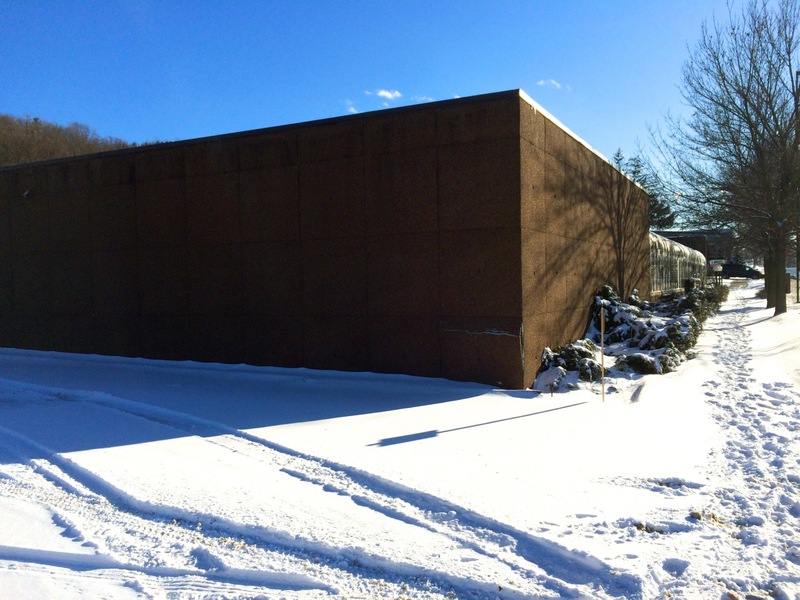 Vegetation along Spencer Road will be cleared-up, and because of the grade, a retaining wall is being planned along that back end to support the slope soil to make room for the parking lot. 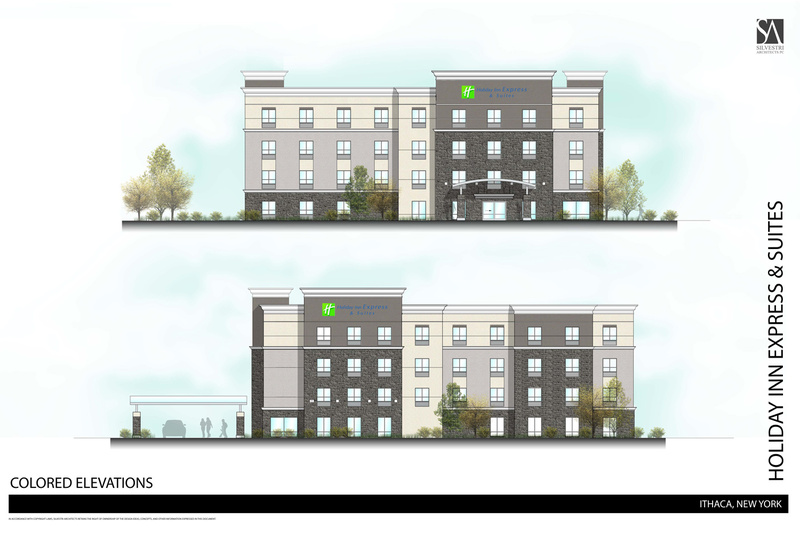 The hotel plans are still slated for a 4-story, 11,769 square foot, 76 room and 76 parking space project, developed by Rudra Management and Rosewood Hotels based out of Cheektowaga, NY (east of Buffalo). 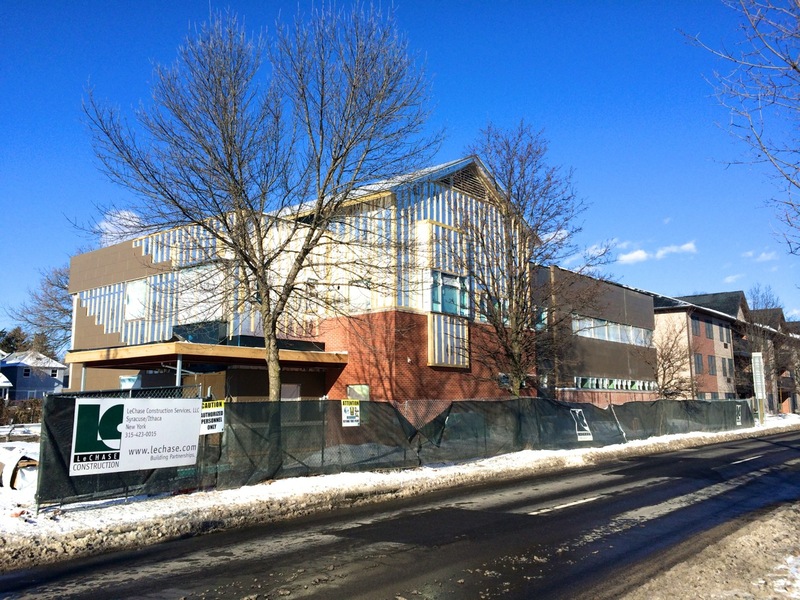 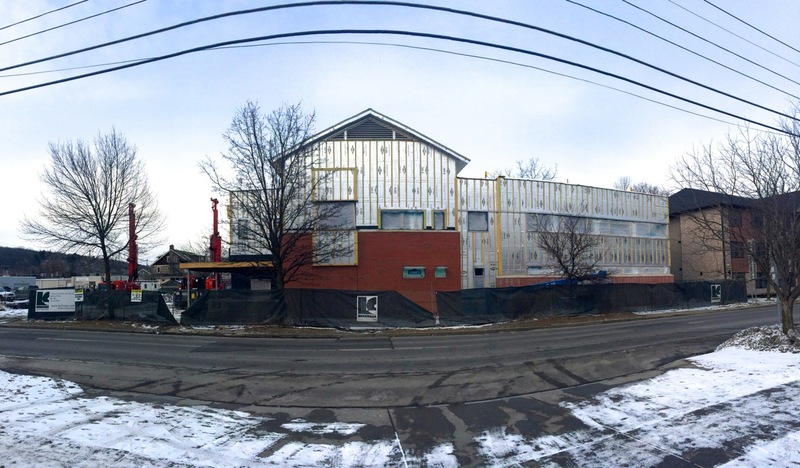 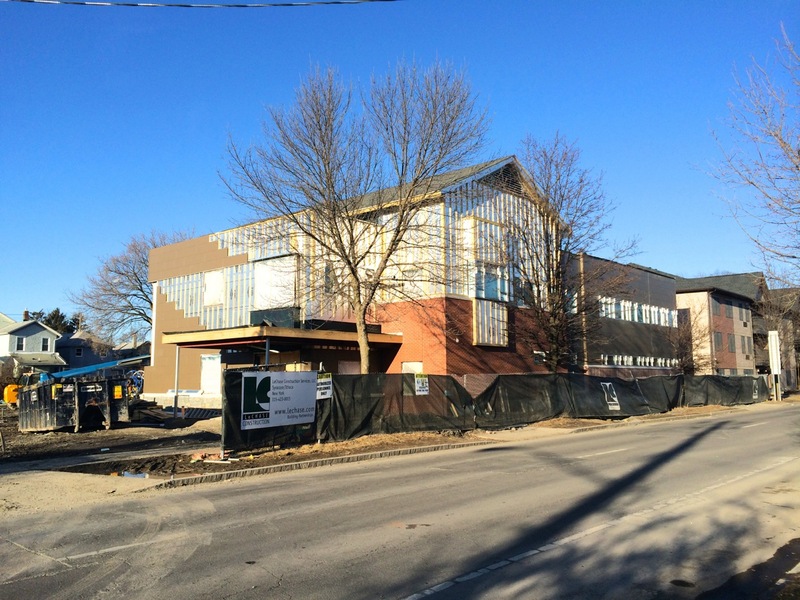 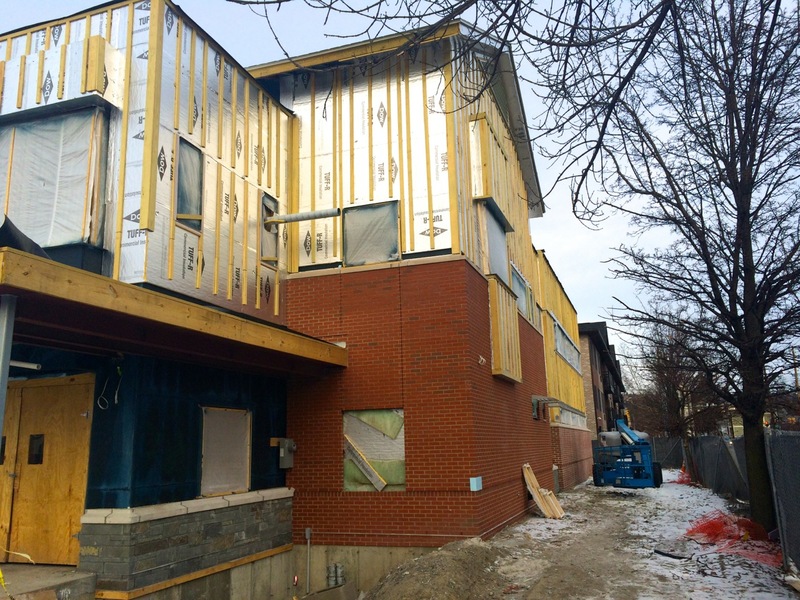 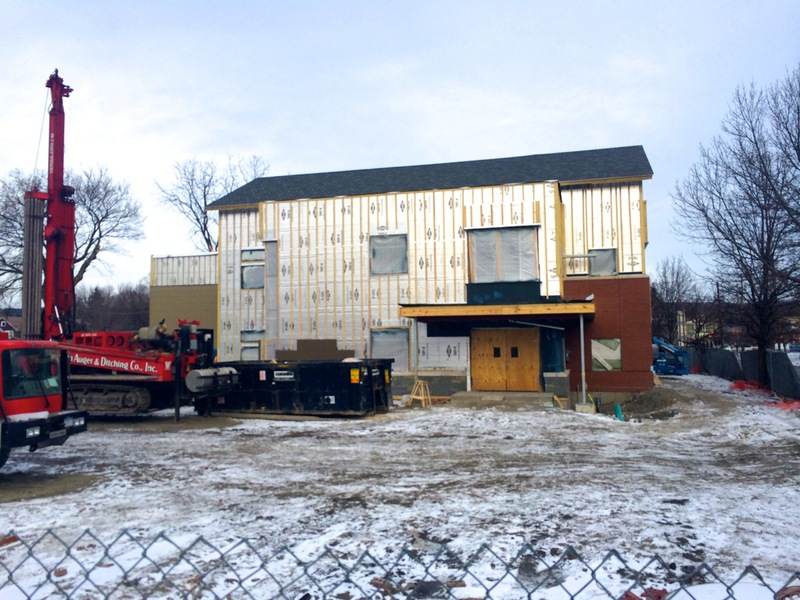 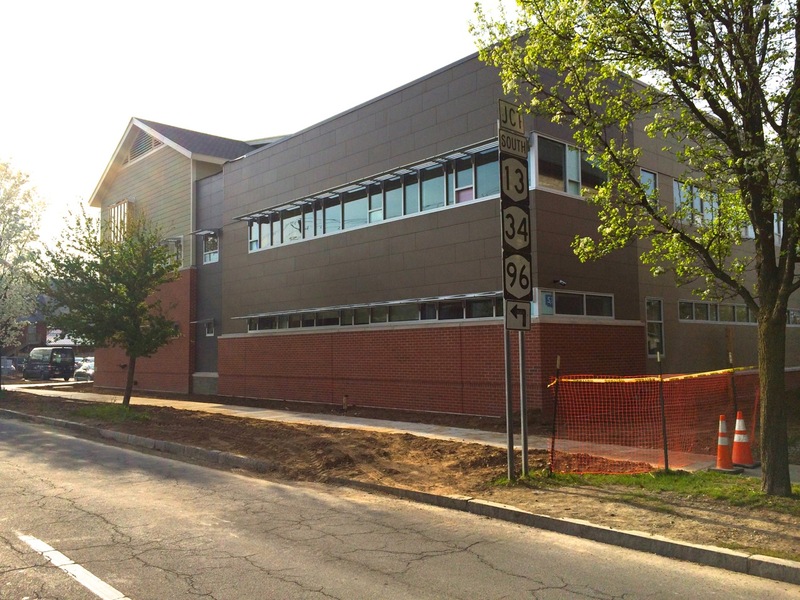 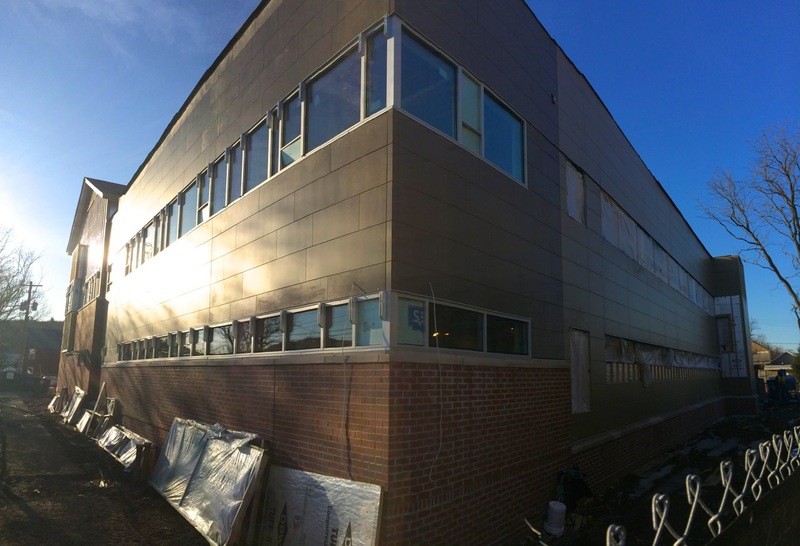 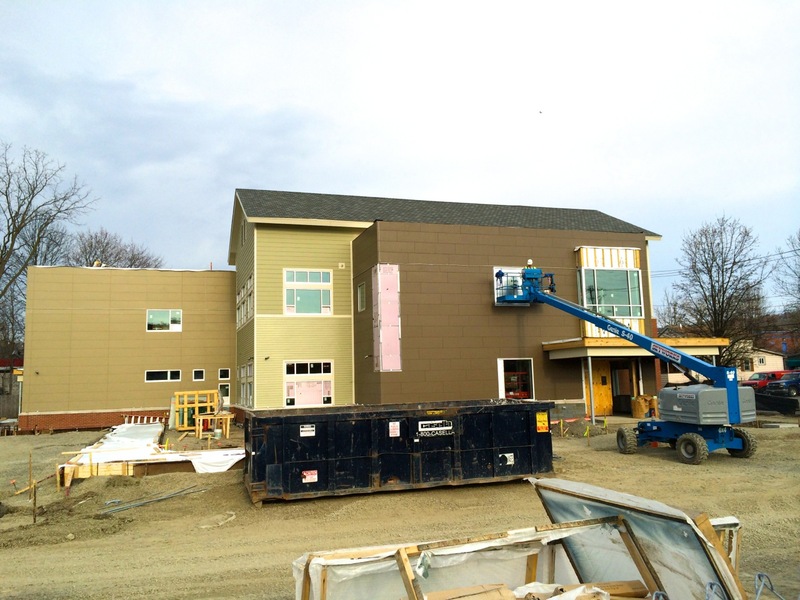 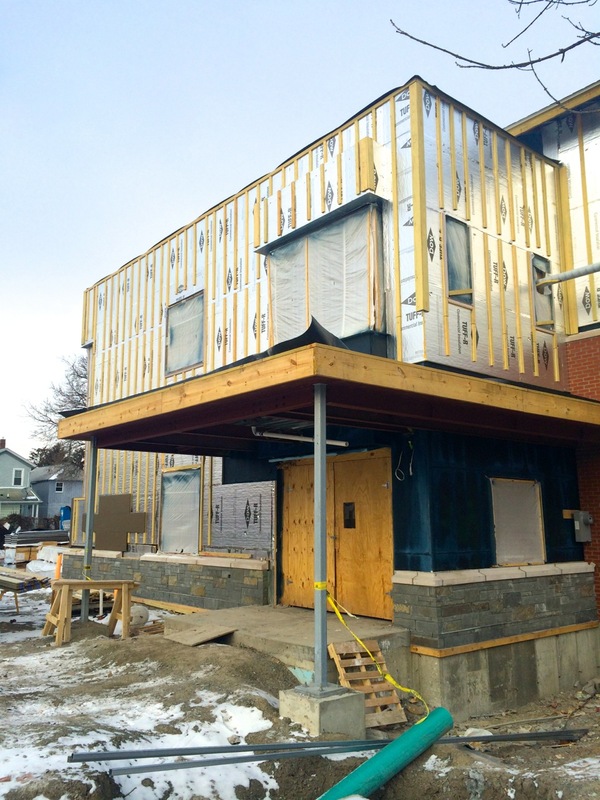 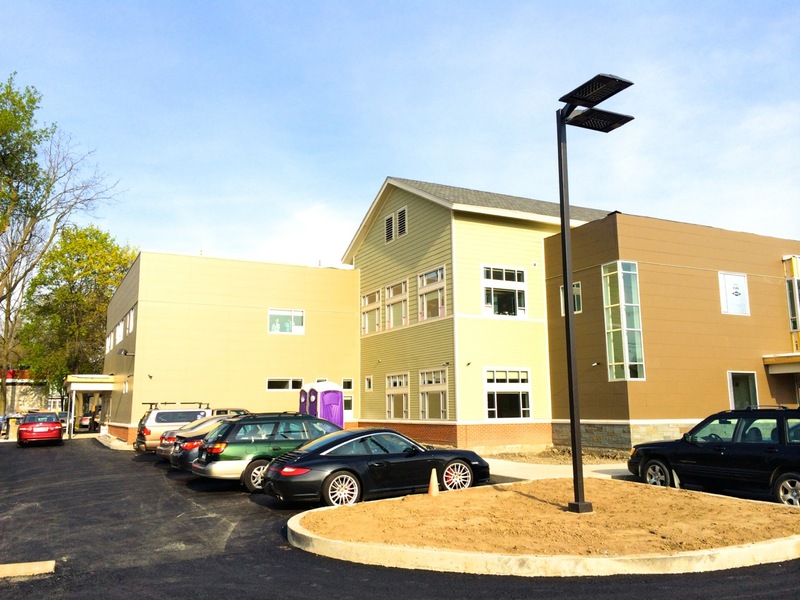 The Planned Parenthood project on Ithaca’s West End has been moving along steadily, as LeChase Construction has installed Dow TUFF-R boards on the exterior, which boosts the overall R-value (resistance to heat flow) of the thermal envelope. 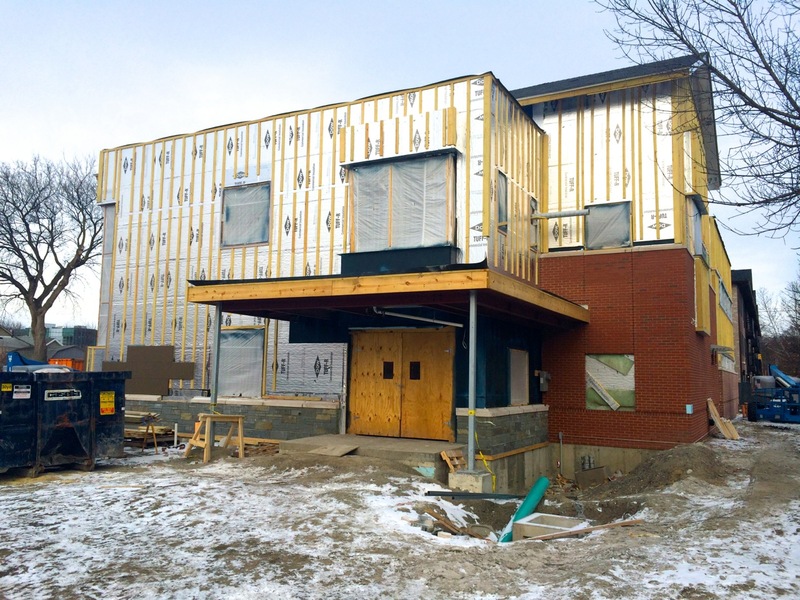 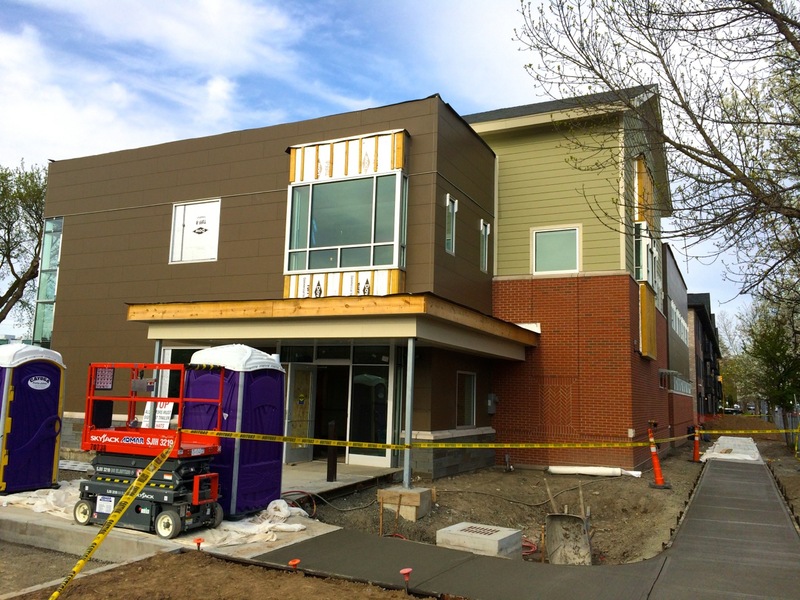 Over the boards, pressure-treated wood strips have been fastened to hang the fiber-cement panels that make up the finish layer of most of the facade, which has begun installation along the northern west face. 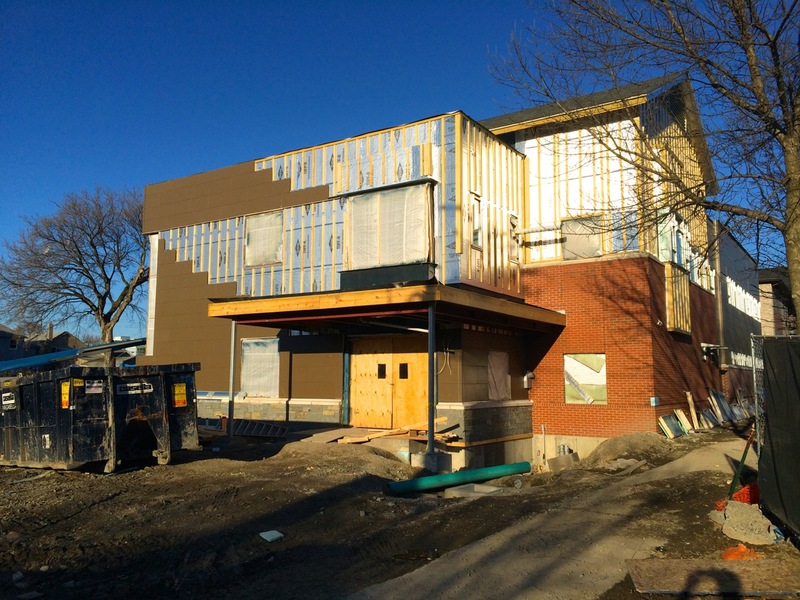 The sections of stone base along the bottom have also been completed, and once the weather gets warmer and more panels have been installed, the windows should follow-up right afterwards. 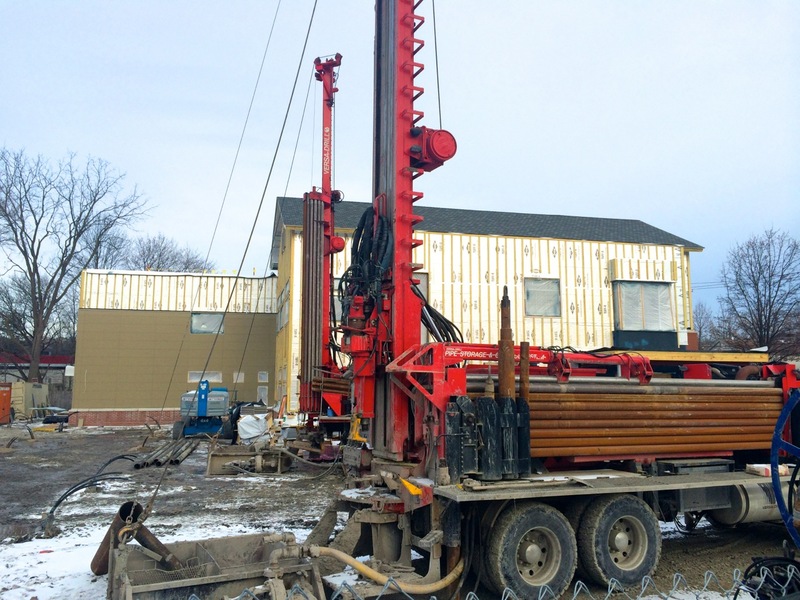 American Auger & Ditching Company is on site to drill the well field for the vertical loop geothermal system (ground source heat pump), which requires drilling a set of well loops anywhere from 50 to 400 feet deep, depending on system size, soil, heat pump specifications, climate, and other design factors. 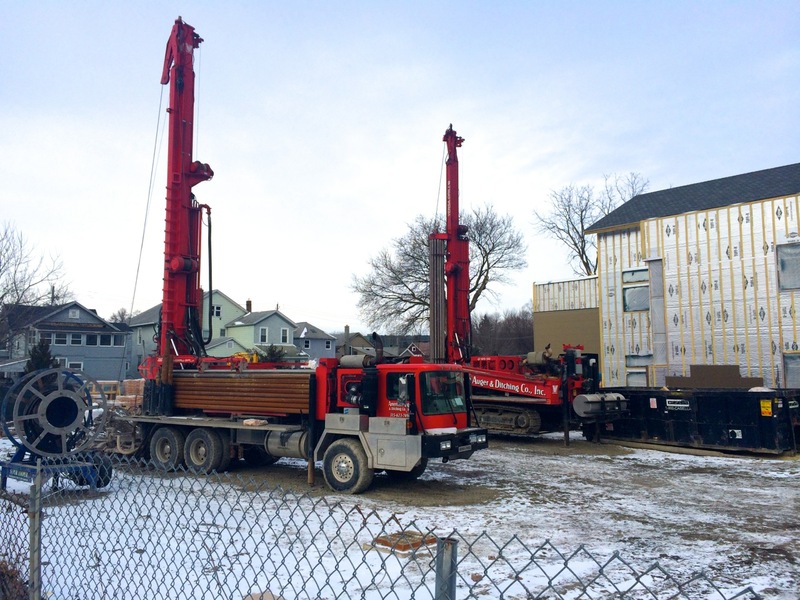 Heat pumps are a broad term, but it simply means moving heat from one place to another. 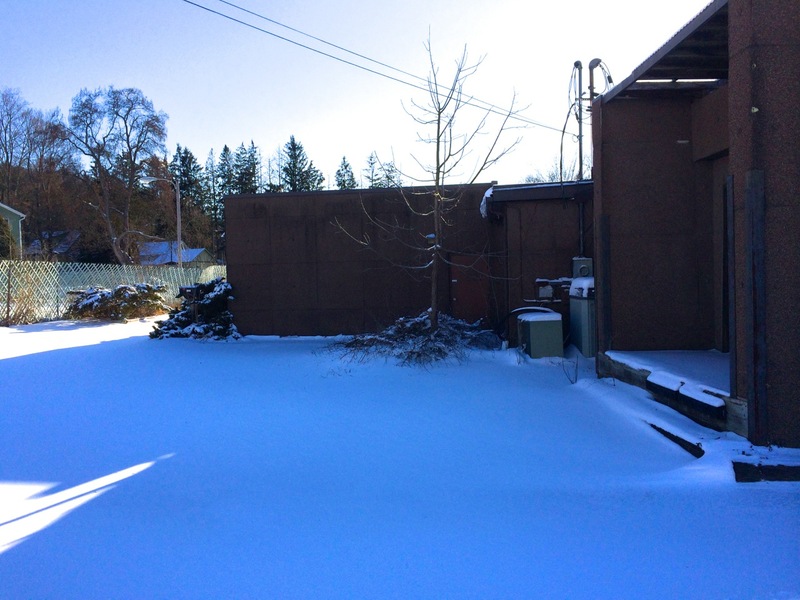 A closed loop geothermal heat pump system works by circulating refrigerant (or anti-freeze) through the loops, which allows the refrigerant to exchange thermal energy with the ground due to thermal inertia (lag) of the soil at these depths. 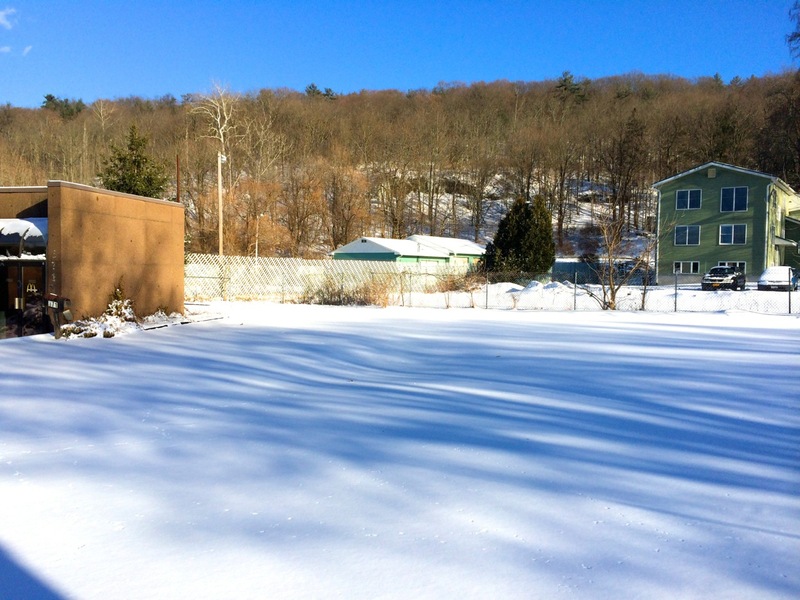 The ground temperature is warmer than outside air in the winter, and cooler in the summer, since the thermal energy from the sun and precipitation lessens in effect the deeper (and denser) the soil mass in between, until there’s almost no variation. 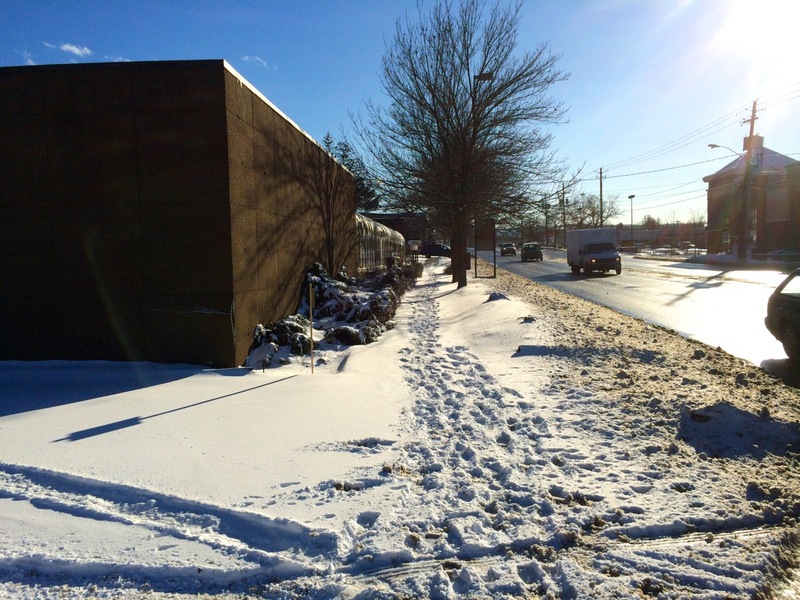 The refrigerant fluid gains thermal energy (heat) from the ground in the winter, but flowing in-reverse, loses heat in the ground during the summer. 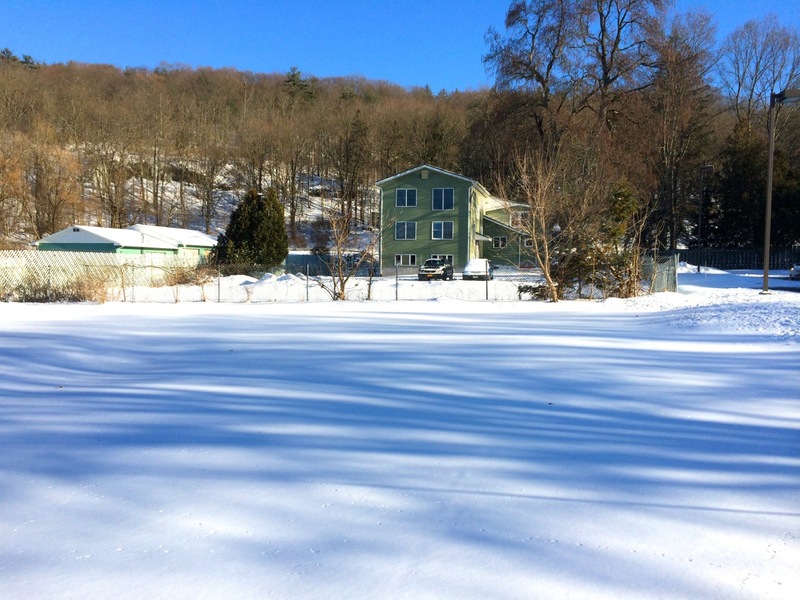 Once inside, the heat pump exchanges the energy with a heating system, and/or a cooling system, depending on the season, space, and type of system. 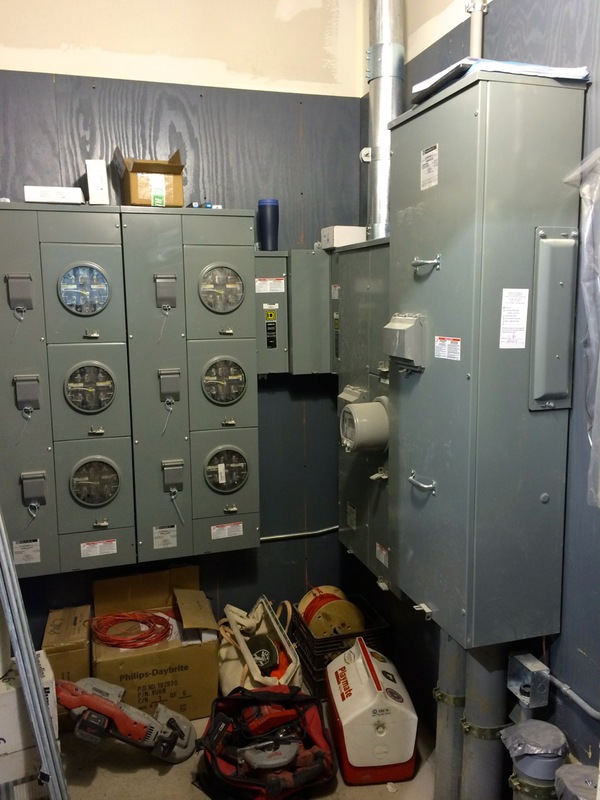 Heat pump systems work in conjunction with other devices, typically forced-air HVAC systems (servicing air through return and supply ducts) and hydronic systems (servicing air by circulating water through radiators and baseboards). 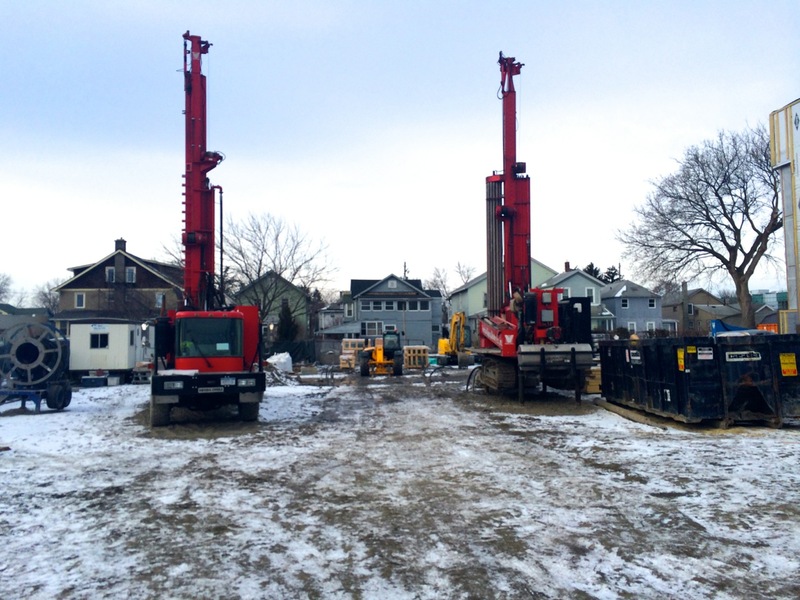 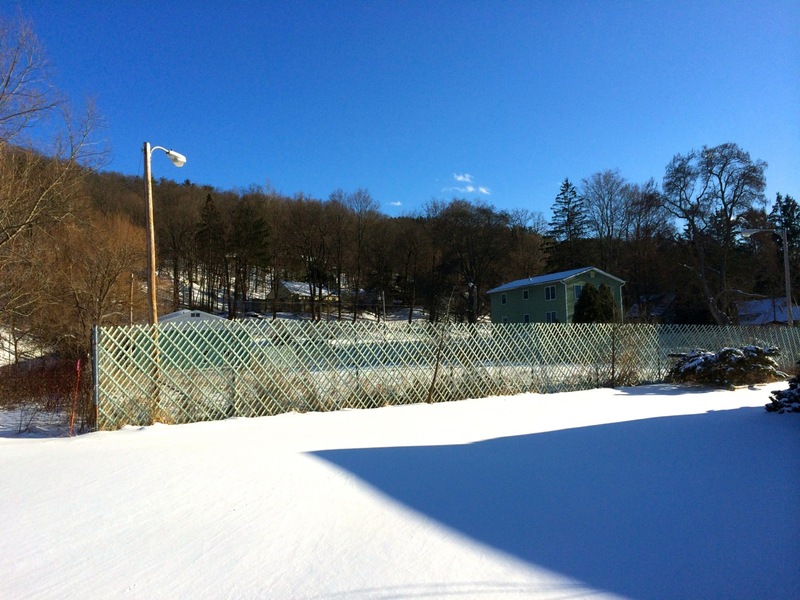 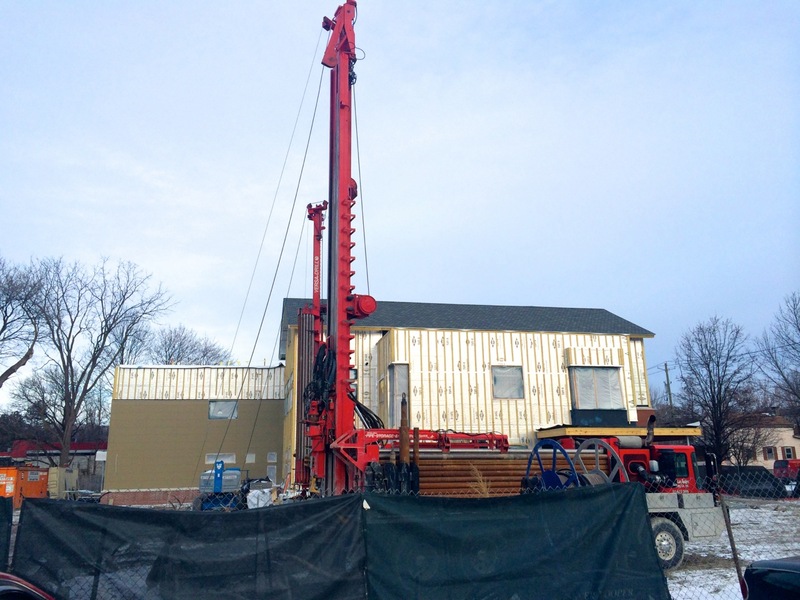 In addition to this project, we’ll be seeing Purity Ice Cream installing a geothermal heat pump system as well. 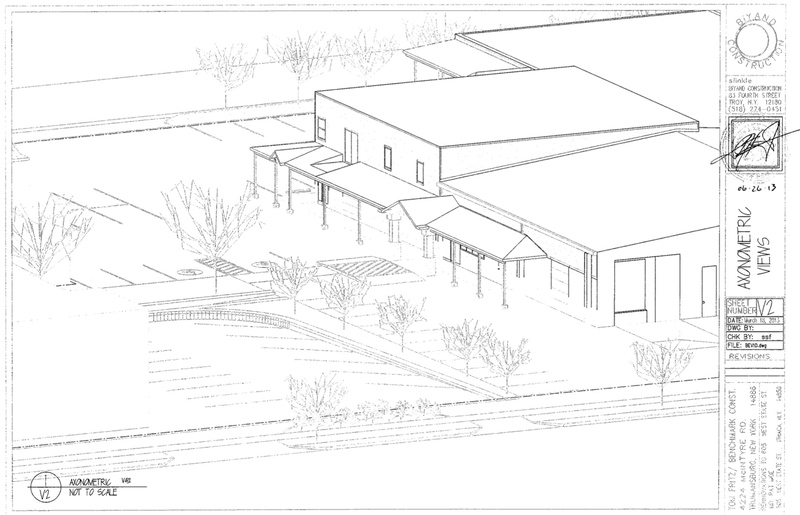 The latest updates and a new serving area render are on their Facebook Page. 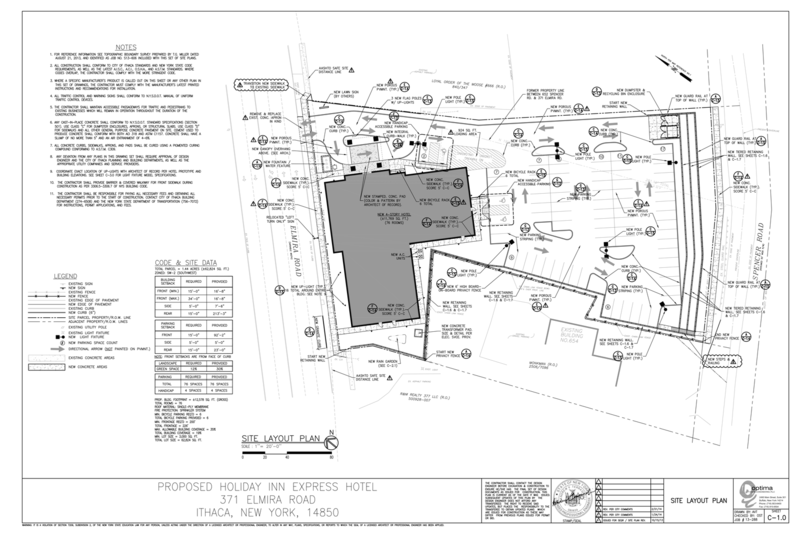 Here are a few shots of the plans for developer Jayesh Patel‘s proposed hotel on 339 Elmira Road, in addition to the Holiday Inn Express he’s developing at 371 Elmira Road. 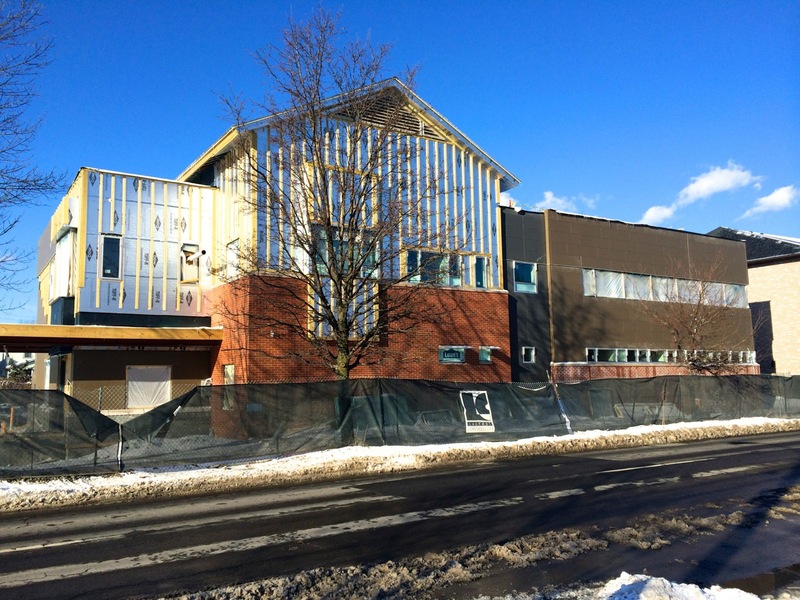 His Cheektowaga development firm (Rudra Management and Rosewood Hotels, 24 hotels) also just recently closed on the purchase of the Dunlop Building on Grand Island, between Buffalo and Niagara Falls, for what seems to be a large renovation undertaking to restore the building to new use; it will take $1.8 million just to get the water and sewage infrastructure back in order to begin the process of remediation. 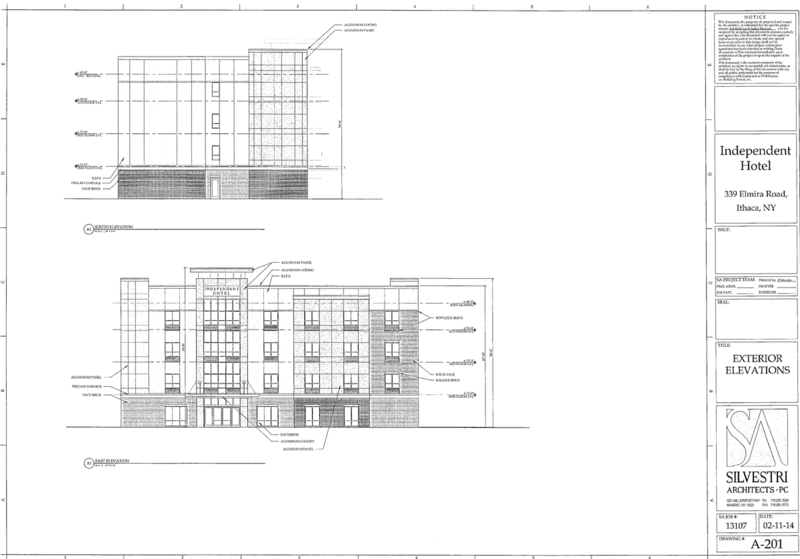 The plans for the 339 Elmira Road project show a total of 37 rooms, 37 parking spaces, four stories, and a gross floor area of 6,468 SF at a cost of $1.7 million on the 0.59 acre site. 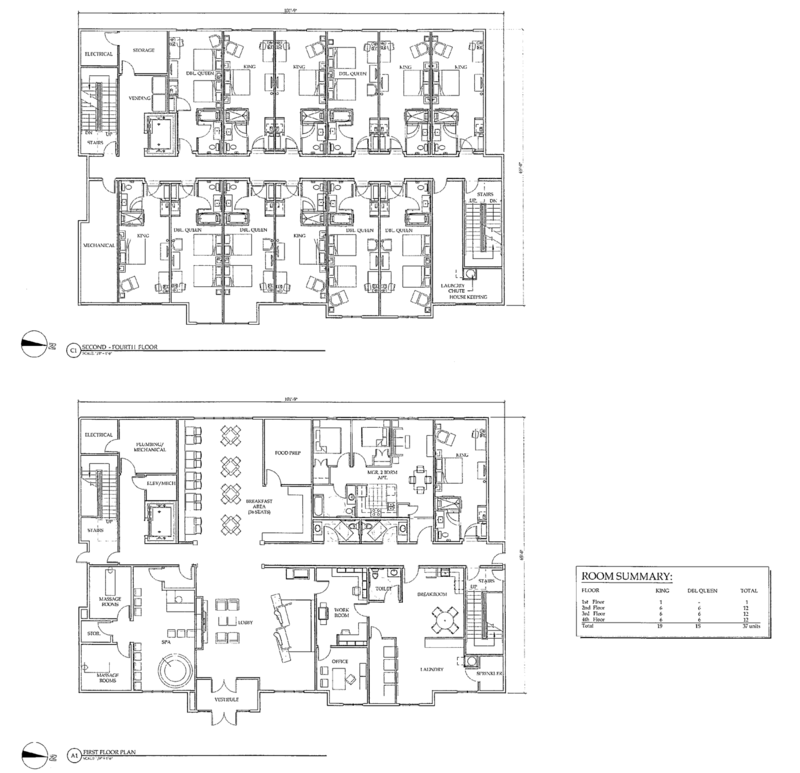 At about $46,000 per room, this project should be similar to the Holiday Inn Express, which comes in at $39,500 per room (76 room, $3 million project). 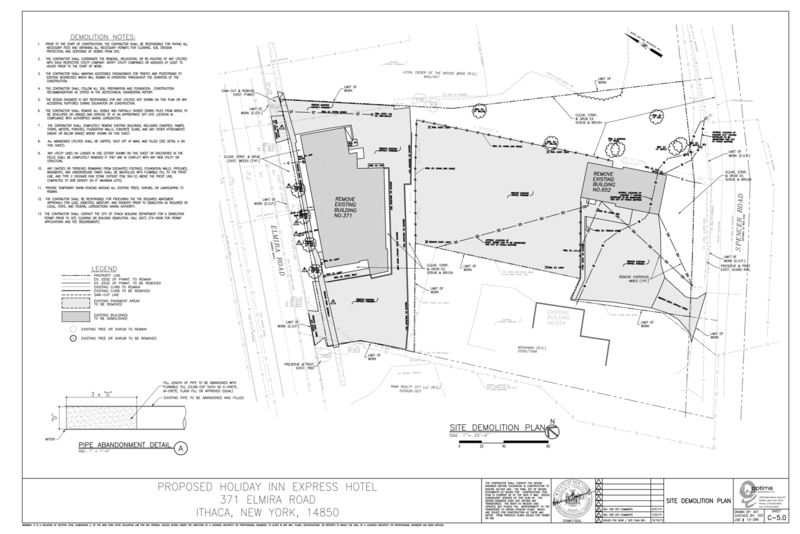 The proposed 4-story, 11,769 square foot, 76 room and 76 parking space Holiday Inn Express at 371 Elmira Road had its site plan review postponed for next meeting so that the developer Jay Patel could present and answer questions in-person. 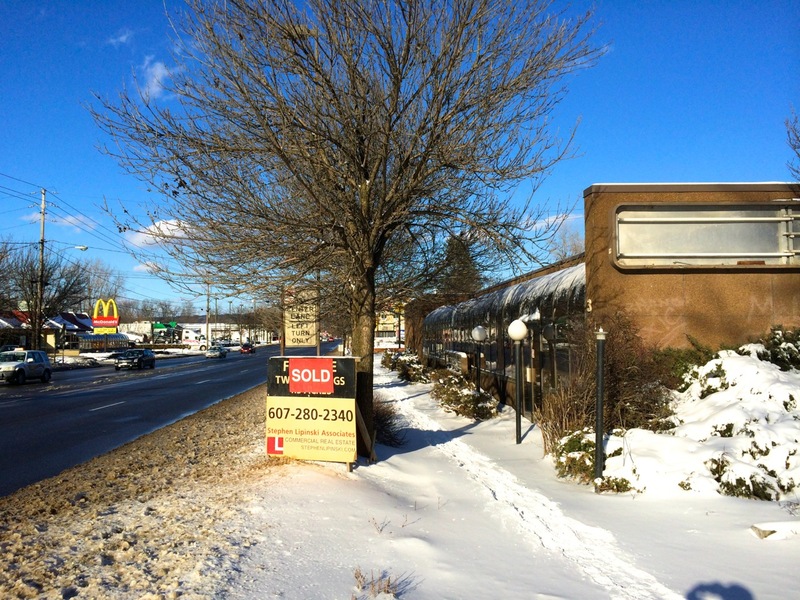 In addition to this site, Mr. Patel is also planning another hotel development down the road at 339 Elmira, which was sold at auction this past June, 2013. 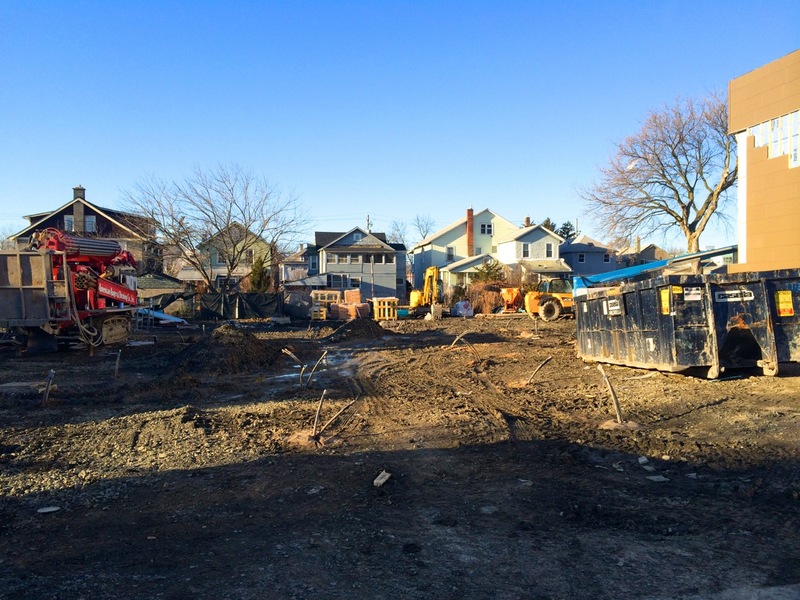 The same team out of Buffalo, NY, Silvestri Architects and Optima Design & Engineering are working on the proposal. 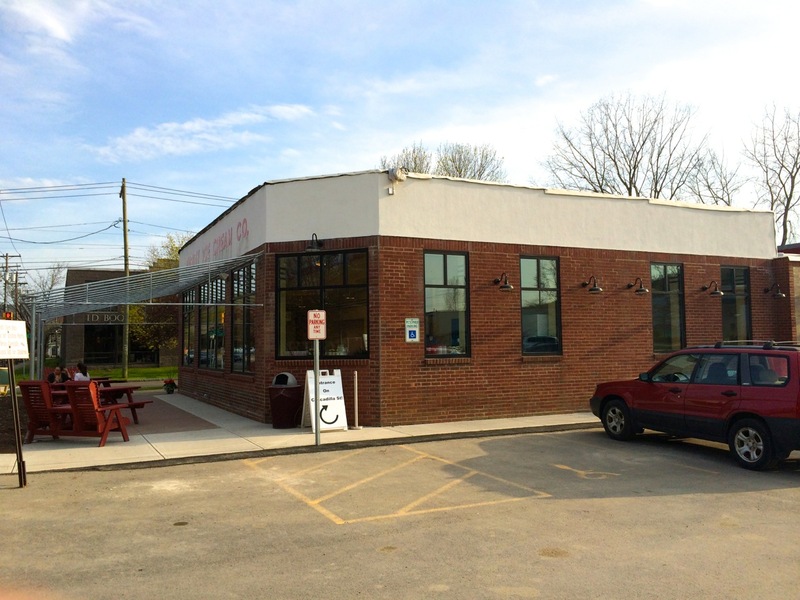 The site previously contained the Salvation Army Store, which moved to its new building down the road in 2009. 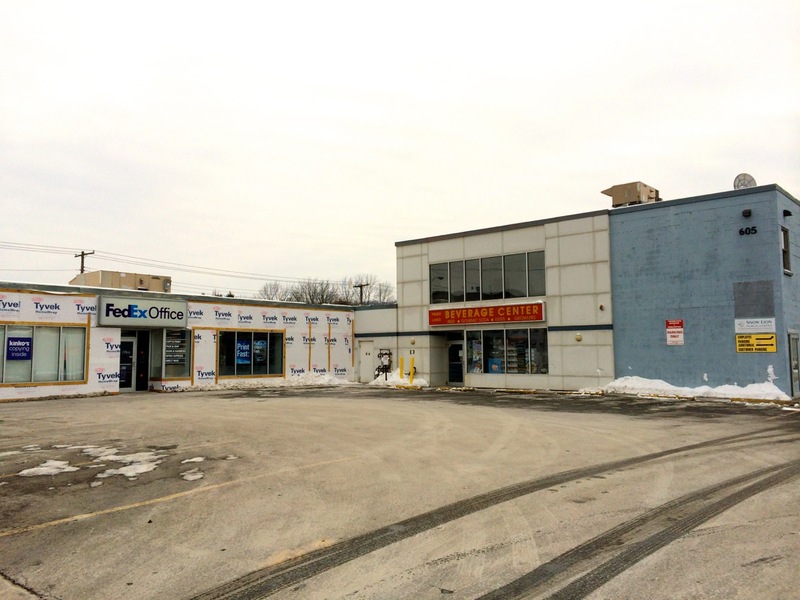 The retail building housing the Finger Lakes Beverage Center and FedEx Office at 605 West State Street, Westgate Plaza looks to begin their renovation work this year, as expected in their site plan review materials submitted in the Summer of last year. 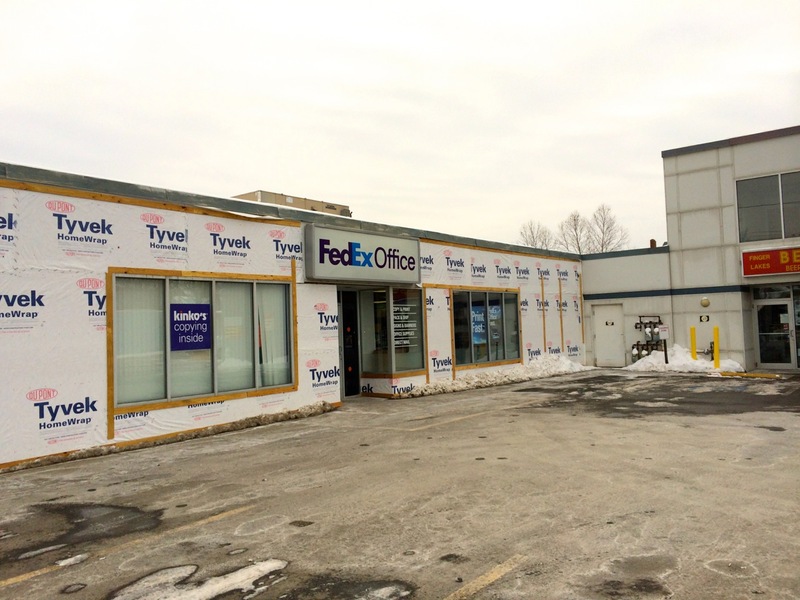 The FedEx space has been wrapped with Tyvek, and I’ve heard that work is in full swing on the interior towards the south end of the building. 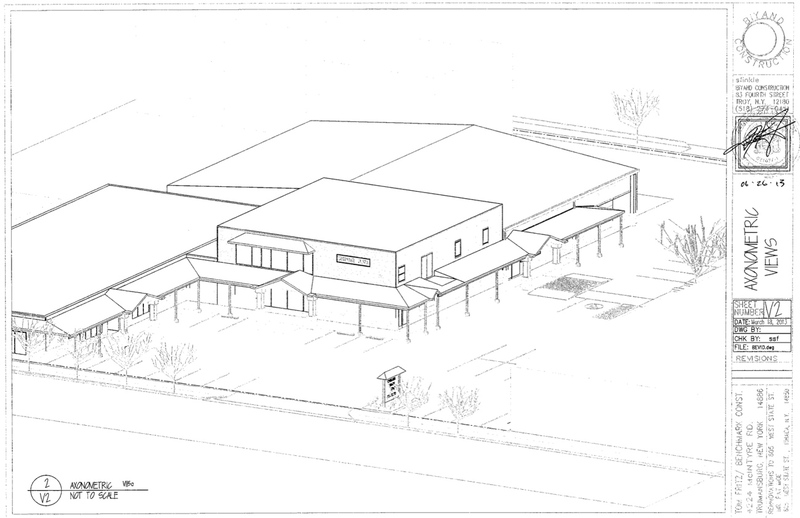 Drawings of the planned exterior are below, along with photos taken a couple weeks ago. 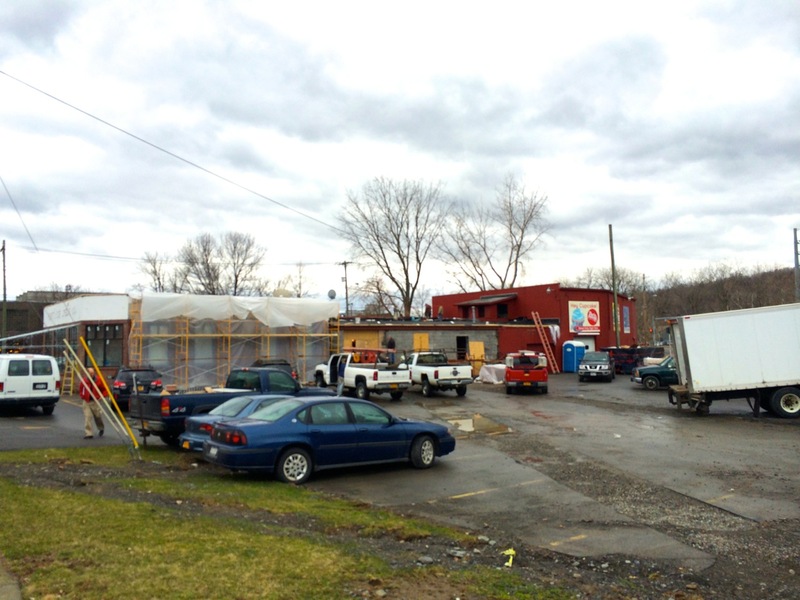 The plans will expand the Finger Lakes Beverage Center store area, add an entry along the western wall, a rebuilt pitched roof, parking lot improvements, and a wrap-around awning.